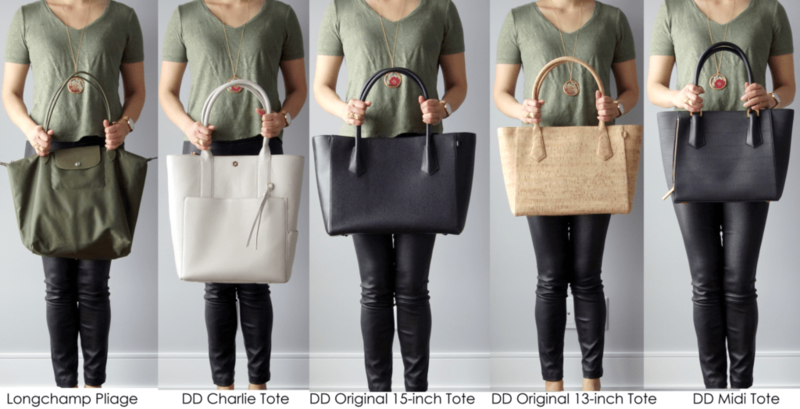 Review & Giveaway: Dagne Dover Classic Tote 13″ and 15″, Midi Tote, Charlie Tote & Lola Pouch | Save. Spend. Splurge. Phew. 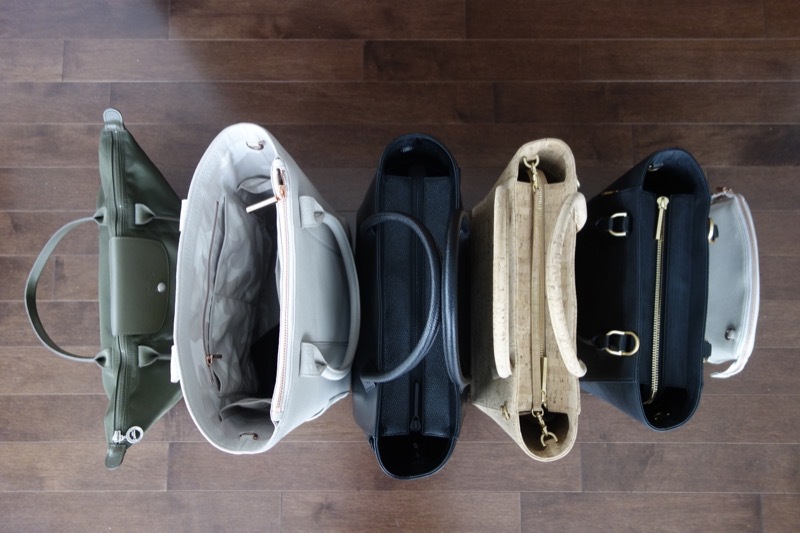 It was difficult just listing out all the bags I’ll be reviewing in this post today. 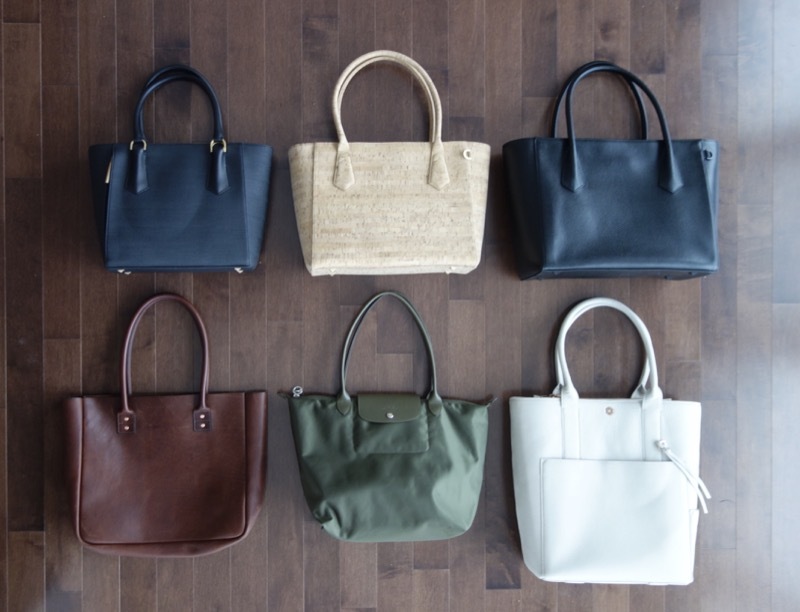 If you’re interested in just Dagne Dover bags because you’ve been eying these beauties, you’ve come to the right spot. Instead of by size — 15″ or 13″, they’re now called “Classic”, “Legend”, “Midi” and “Petite” and have gone under a little makeover and re-branding. I have old and new versions of the bag. The rest were generously given to me as part of this review by Dagne Dover, although I had to pay for the shipping costs since I live in Canada & they don’t ship internationally, so it wasn’t completely free. Even though they were gifted, this review will remain unbiased and honest about each bag’s pros and cons. Promise. Pinky swear. Namely, the Large Longchamp Neo Pliage and the Paterson & Salisbury Large Tote just in that photo above. The Pliage is about the same size. I’m holding the Bose case so you have a size comparison here. I do have small hands. The size differences are slight. 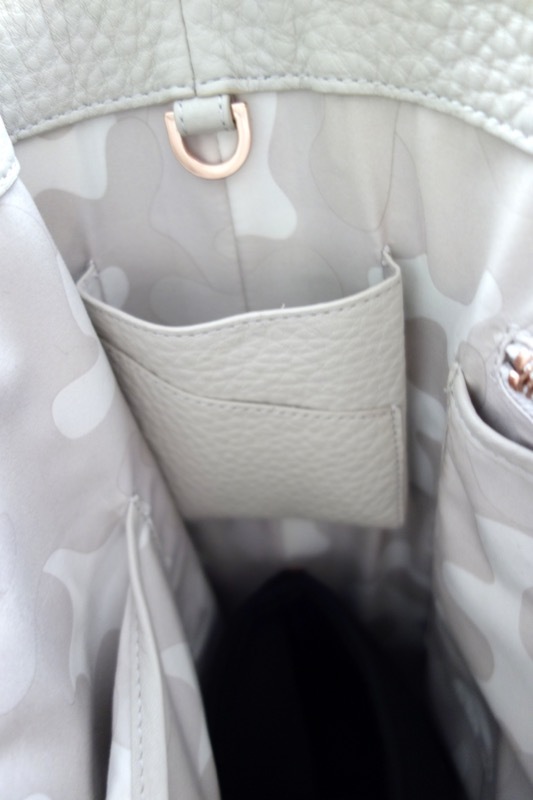 Lots of pockets inside and on the newer versions, on the outside. 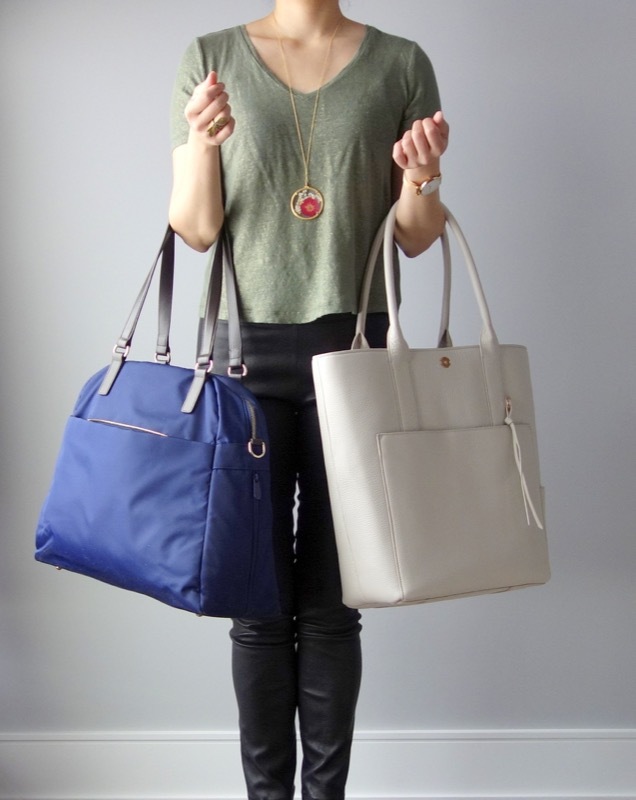 The older, Original Signature Totes (15″ and 13″) do not have handles that fold down, so keep that in mind. 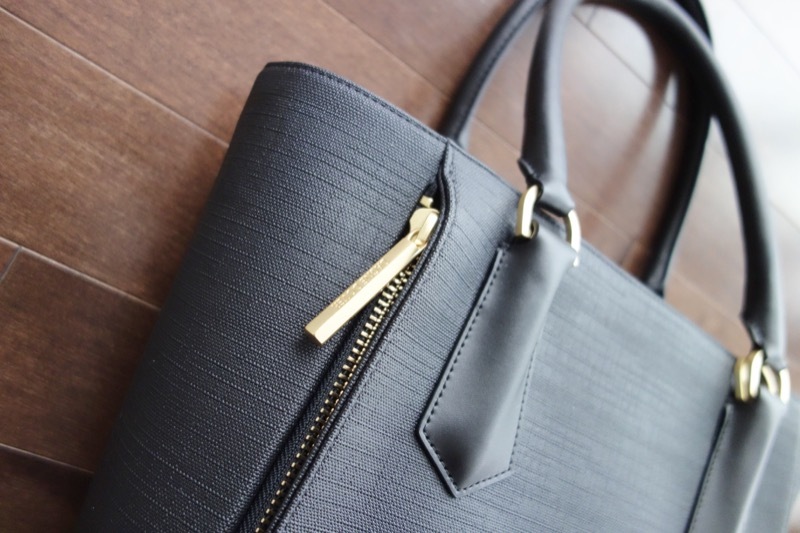 You can see the Bone Leather Charlie Tote, and the Midi black tote (with gold hardware) at the end, have handles that fold down. 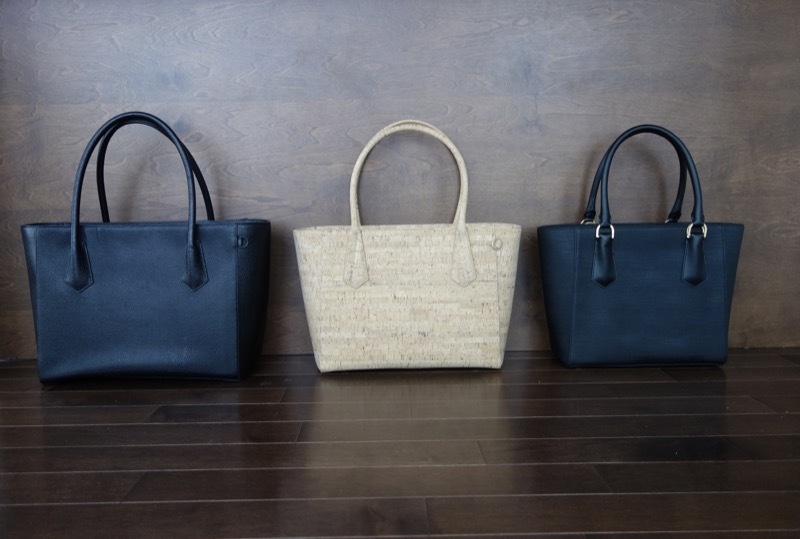 The other two totes in the middle (Black Onyx & Cork) are old and the handles stay straight up). Their new redesign allows the handles to fold down which is great because sometimes you need to stuff it overheard or under your seat and the handles get in the way. This doesn’t bother me as much because I don’t travel like I used to, and if I do take a trip back with Baby Bun, I will be wearing a backpack to have two hands free to wrangle him, not toting a stylish shoulder bag. 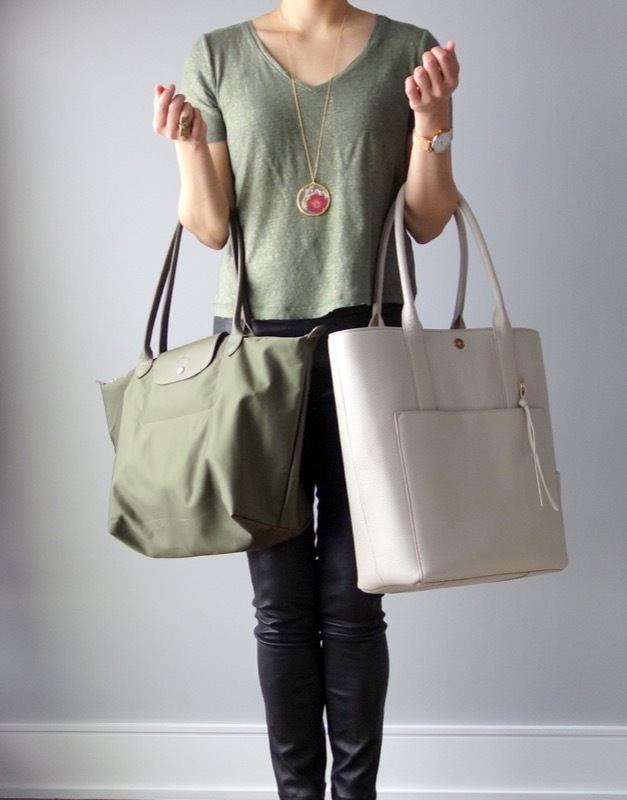 If I were to travel again, I’d more than likely bring one of these totes as a personal purse. 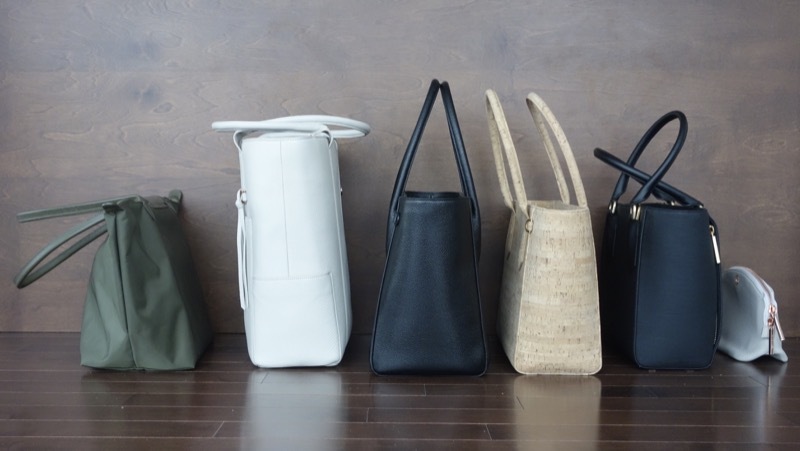 All the Midi & Legend totes have pyramid feet on the bottom (top row), but not the Charlie Tote as you can see. They all stand up on their own without tipping over or needing help even the pouches. 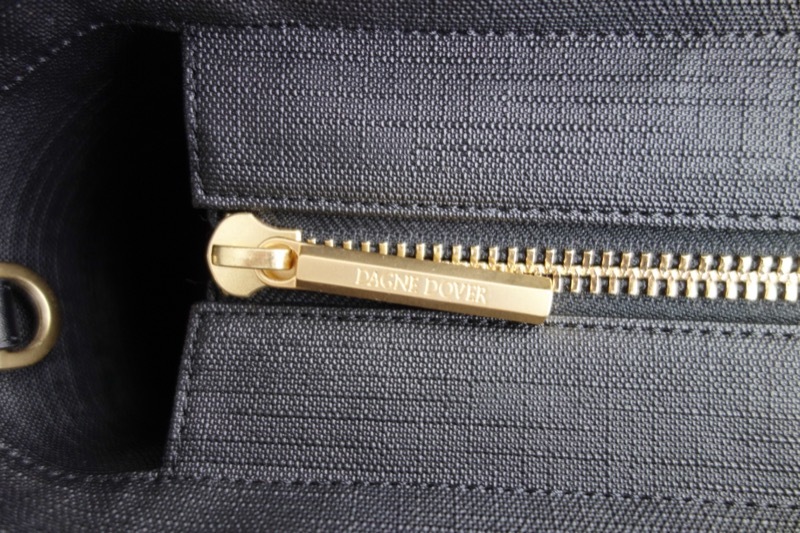 From the zippers (that are not sharp, I have run my fingers over them and the quality is excellent as they are smooth and won’t scratch your hands), to the embossed Dagne Dover logos (or my favourite, the very discreet metal logo in front), it is stunning. They’re all slightly heavy except when you choose a material like cork which is super, ultralight, but as my partner pointed out, cork breaks down eventually because it’s so delicate. I think it looks good as a summer bag though, so I am not convinced. The reason why they’re heavy is the quality and weight of the leather and if weight is a serious issue, go for the canvas versions and avoid leather completely. 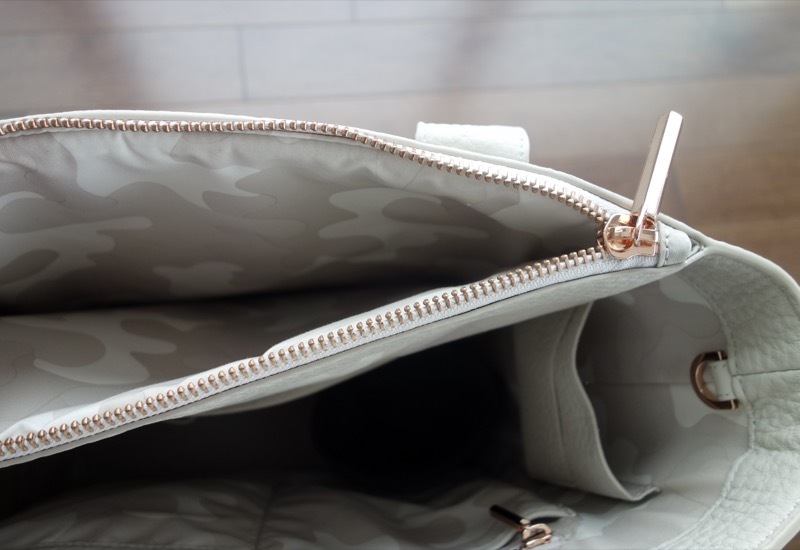 It will never be as light as a nylon Longchamp Pliage bag for instance but you are paying almost the same price for these bags, and you get other major benefits like space, organization, high quality fabric/leather/hardware and style. It’s all up to what you want. Now for each bag in detail. 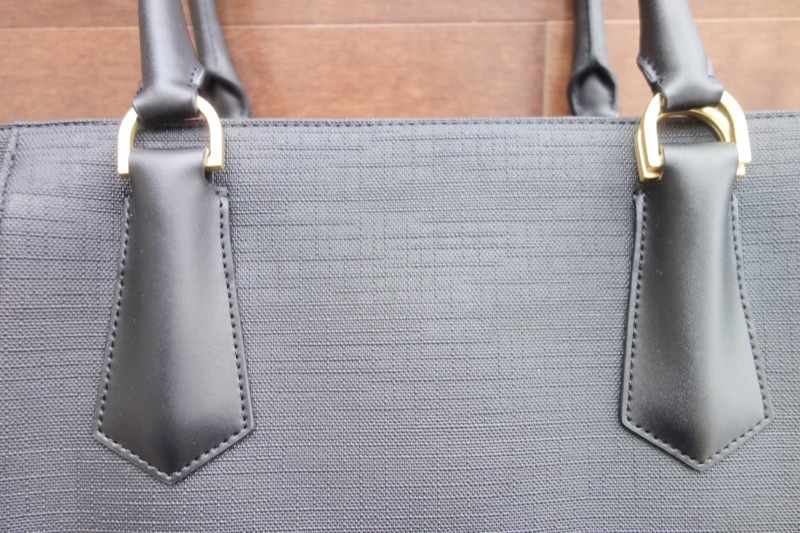 I bought this because it was the biggest 15″ tote they had available, I liked leather, I liked the idea of a stingray embossed motif and it looked seriously good. Excellent. You can see that the handles don’t fold down in the original versions but they do in the new ones. This is a well made, sturdy bag that you can be ROUGH with. I LOVE the black hardware. 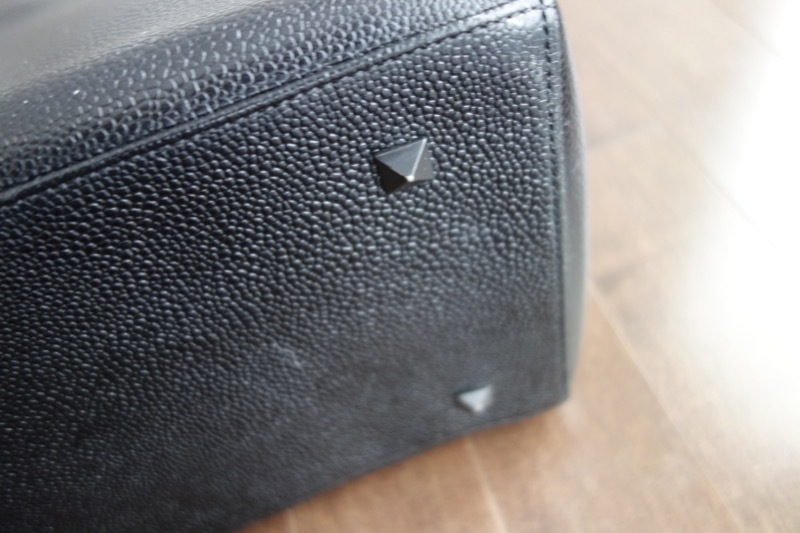 I will say that the little pyramid feet are great because they keep the bag off the ground and from getting dirty, but after a few uses (obviously) the black metal hardware is are starting to wear down from use. You will see all the size comparisons later against each of the bags and against my body, but it is a big bag which means it has lots of space. The leather doesn’t help, and it is lined, plus the hardware in metal? All that quality adds up to weight. It is not heavy like a rock, but it is a hefty weight. I wouldn’t say that you could commute with it unless you are okay with putting it on your lap (or on the ground), when you’re on the bus or subway, but not slinging it over your shoulder 24/7. 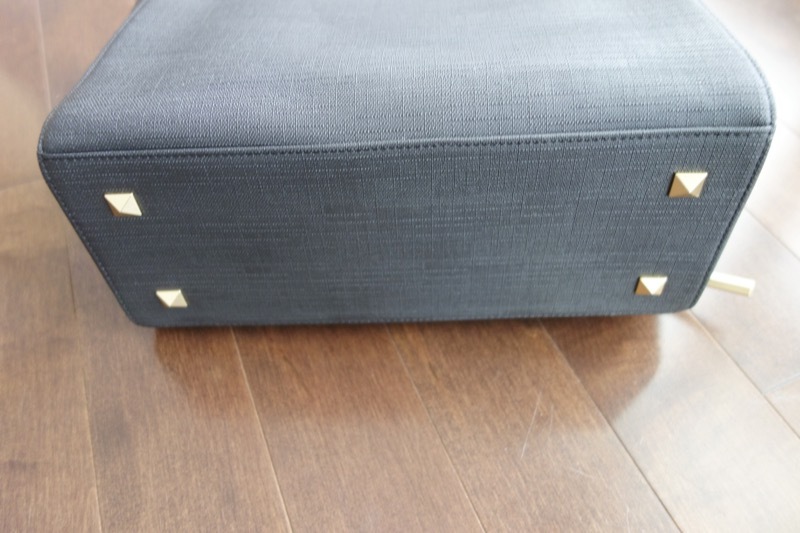 …or without the neoprene case in the flap for the laptop. I also have plenty of room to spare with a water bottle in the neoprene section, my headphone case and two folders. This is a real work/laptop bag. And it zips up fine! An iPad mini can easily go in the slot in front but not anything thicker like a 13″ Macbook Air or 11″ Macbook Air. You can see that I put the Macbook Pro 15″ in there with the iPad Mini. I’d say it is even big enough for a big iPad as well. There is a lot of space in the middle as well. 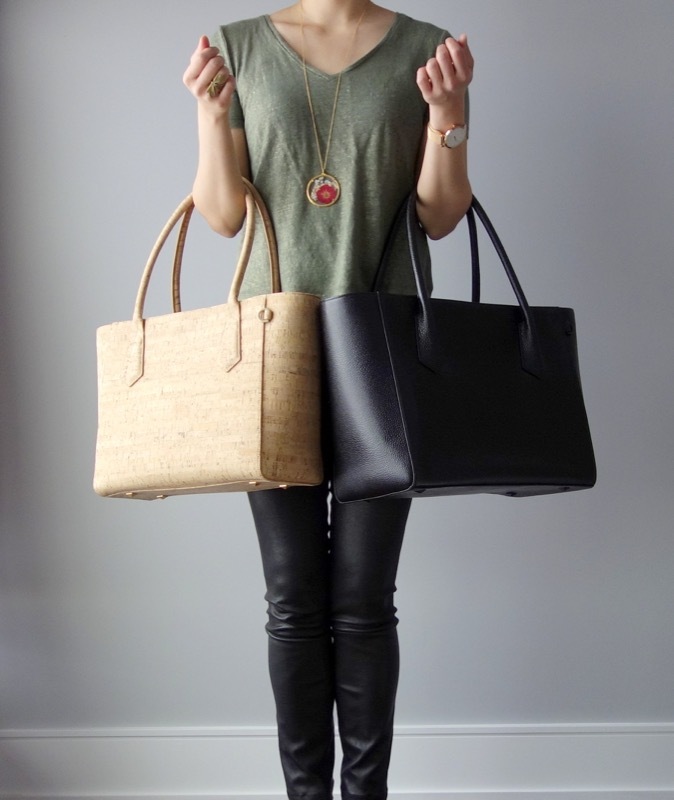 I will say that the older totes are fatter and MUCH harder to sling across your shoulder and carry (especially with a winter jacket), so it is more of a hand bag than anything, but what you lose in convenience, you make up in space. 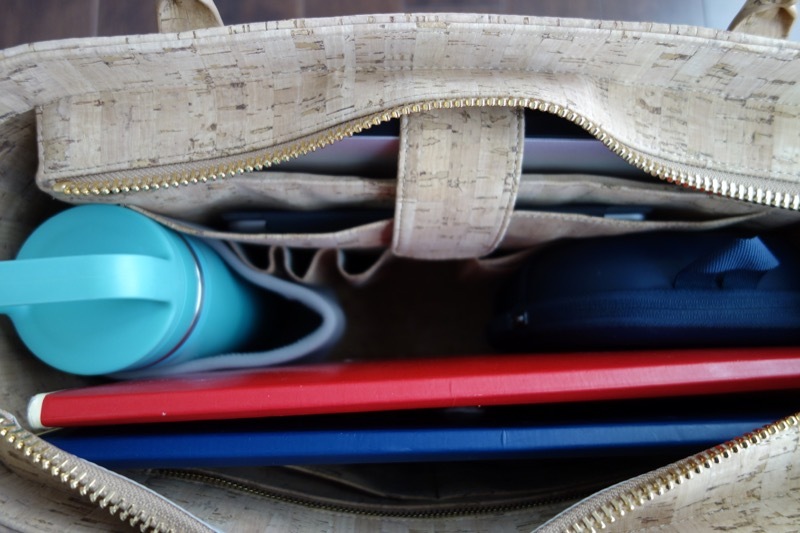 They score very high on organization because you have to work really hard to lose your things in this bag. Their newer bags are slightly more organized than the older versions, hence why they were revamped. I can see the difference between the two. 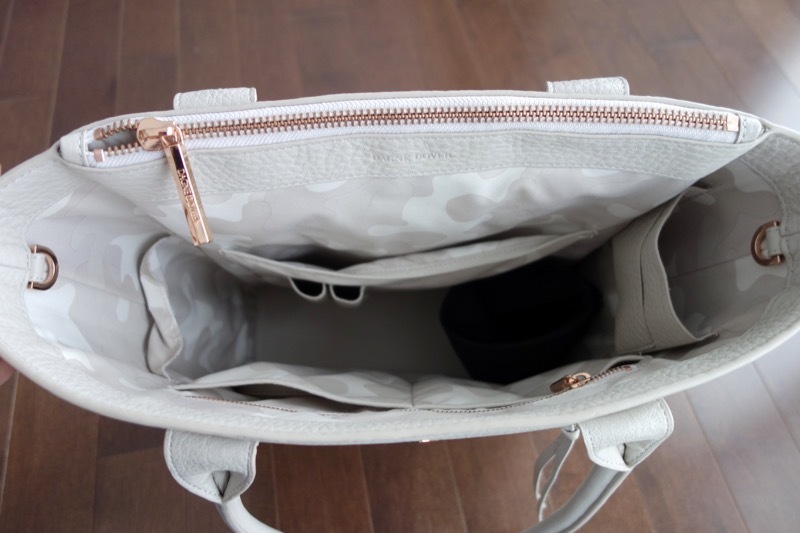 For one thing, there is no front zippered or open pocket to put your metro card or keys or anything like that. 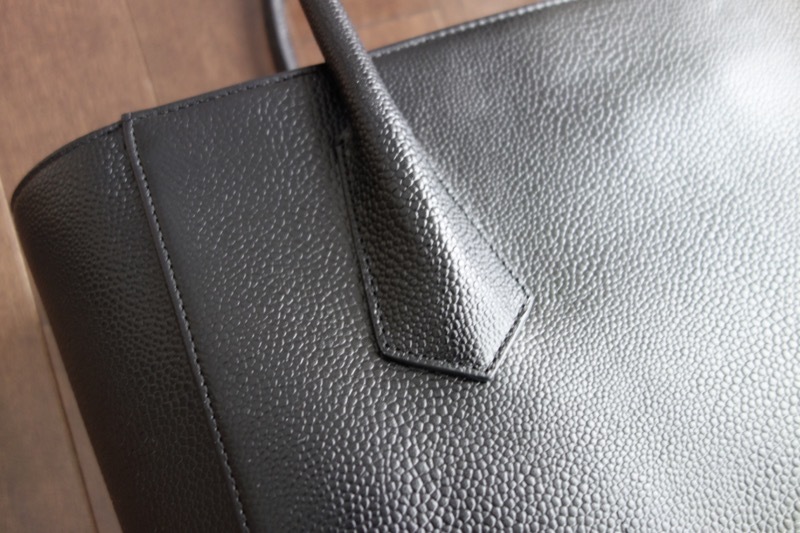 It keeps the entire line and look of the bag extremely sleek and streamlined. The small-bodied Midi is designed for speedy days about town that call for more than a purse but less than a full-size carryall. 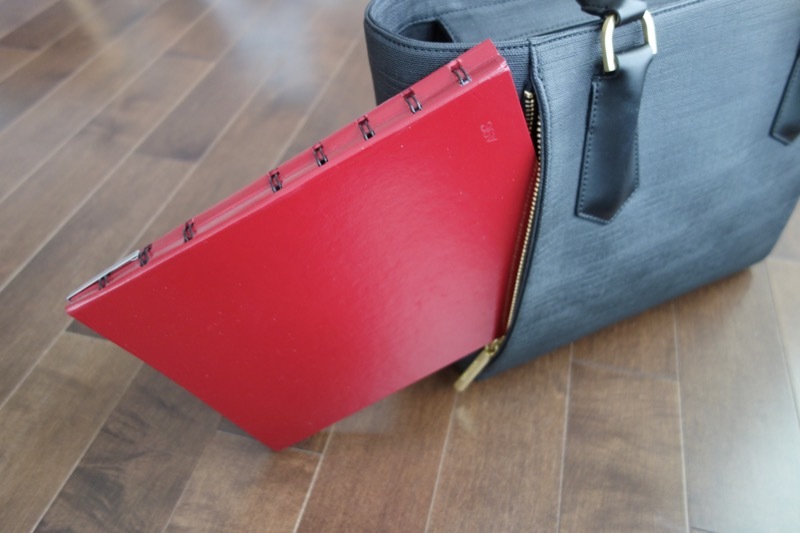 It’s fully equipped with a 10.5” tablet sleeve, pen loops, a water bottle holder, and an array of convenient compartments for wallets, phone, cards and more. Plus, a detachable crossbody strap gives you the option for hands-free carrying. 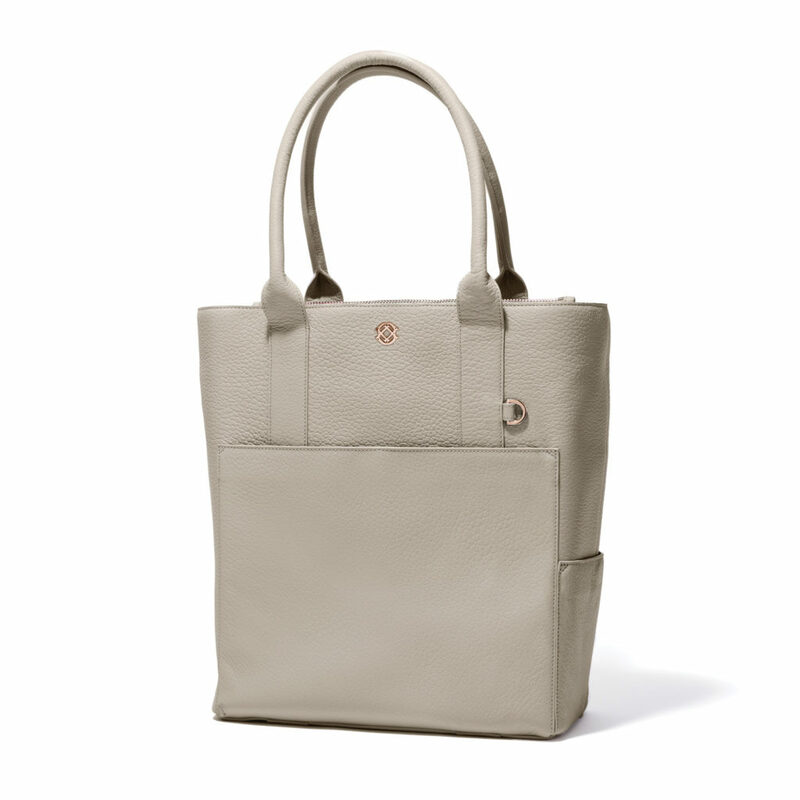 The Midi tote is your work/weekend hybrid that takes you everywhere and fits it all in. Note: They have not updated their stock photos as of late, so I don’t have any fancy product shots. 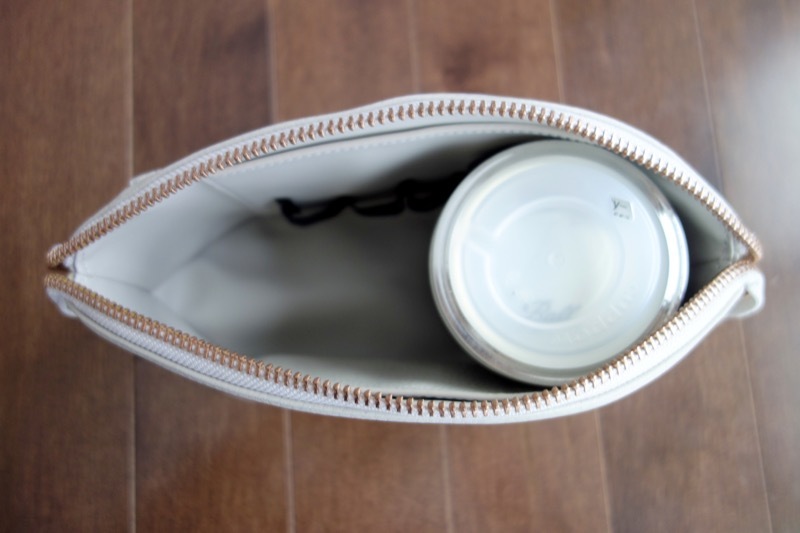 This is the newest feature of their new totes, a side zippered pocket. 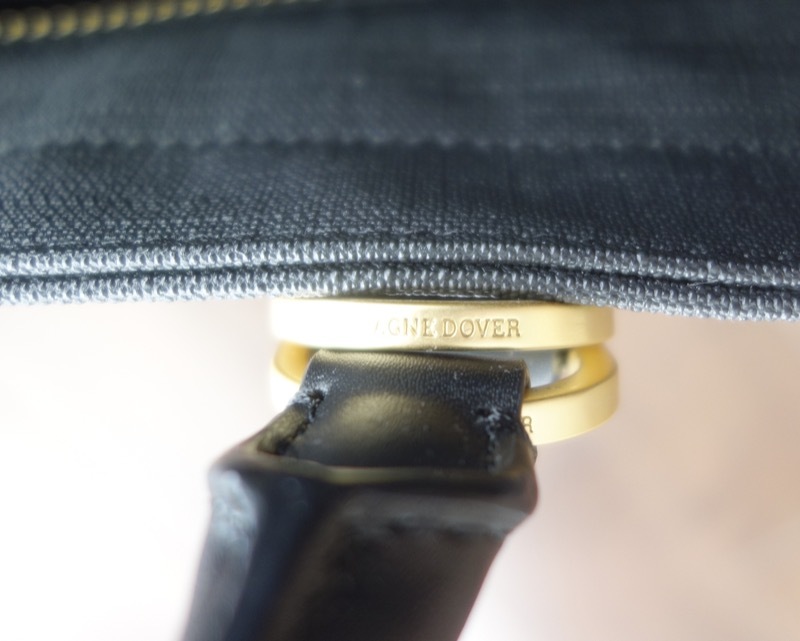 The coated canvas is sturdy, waterproof, and really well made, naturally. The HARDWARE though. My goodness. I don’t love logos but I love that they printed their name all over the place discreetly. And the logo is discreet too. It is the smallest of all the totes being reviewed here today but not as small as the Petite which is a mini, MINI handbag. The new designs have made them slimmer than the older versions of the totes. 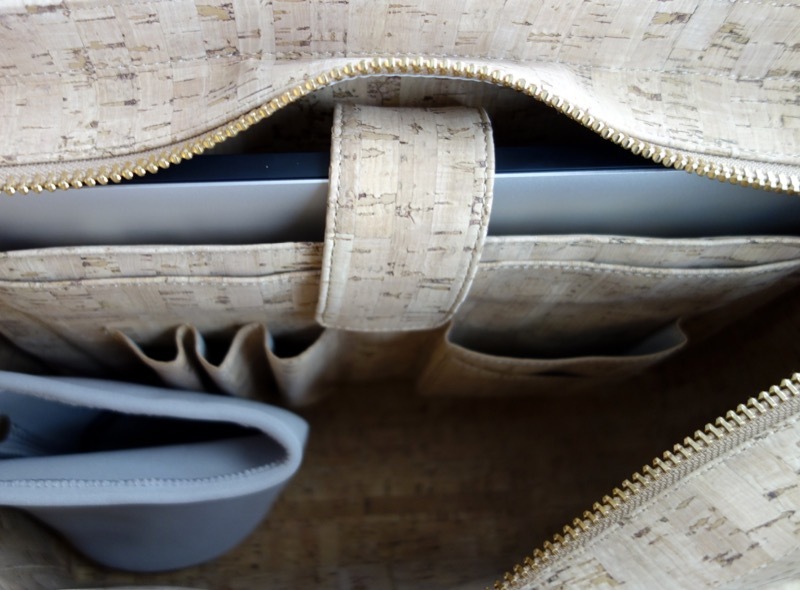 It is almost as light as the 13″ Cork (Original) tote (the cork itself makes it super light), but slightly smaller and made of heavier materials. The handles also now fold down flat with the addition of the D-rings. 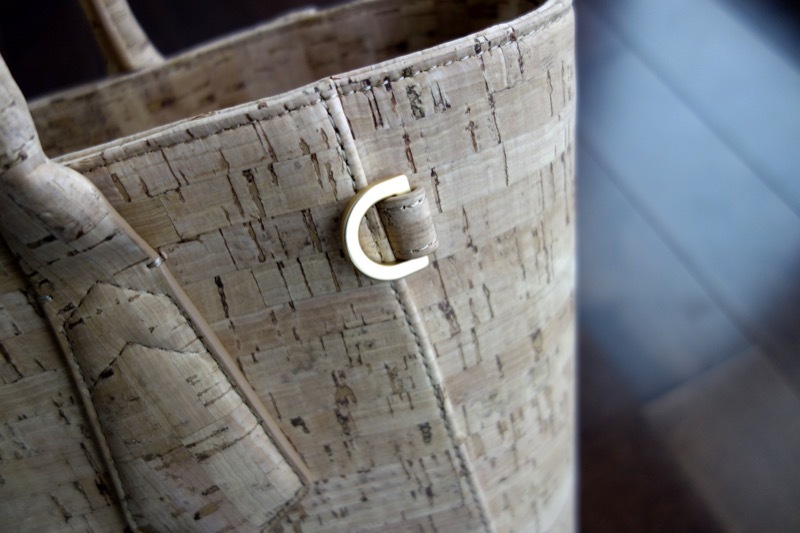 All of their Signature totes come with Pyramid metal feet as well which is a must. I put it on the ground a lot. I took a shot with the white cardboard that came with the bag inside so you could see it easily: It’s quite spacious. They have made it slimmer so there is slightly less space in there. 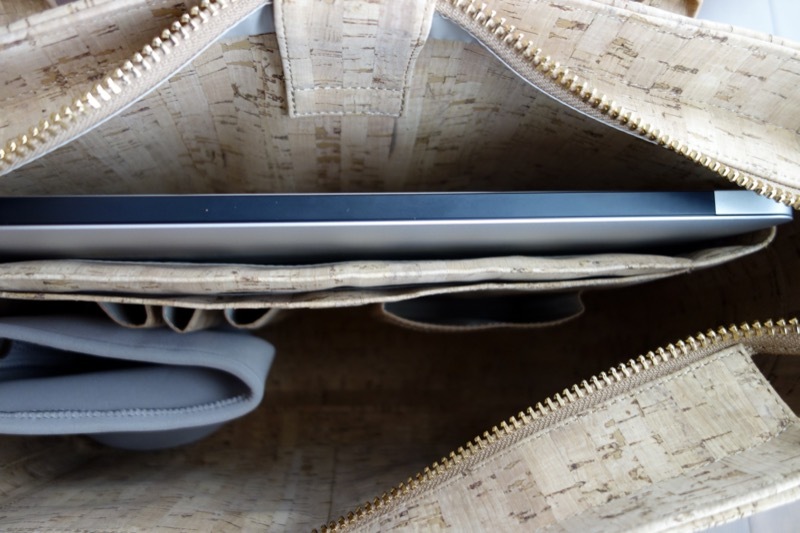 Meaning that in the old version I can fit an 11″ Macbook Pro laptop in its wool felt case all the way across which would squish down the neoprene cup holder inside, and would fit a few more notebooks but not much else. It zips up JUST barely. 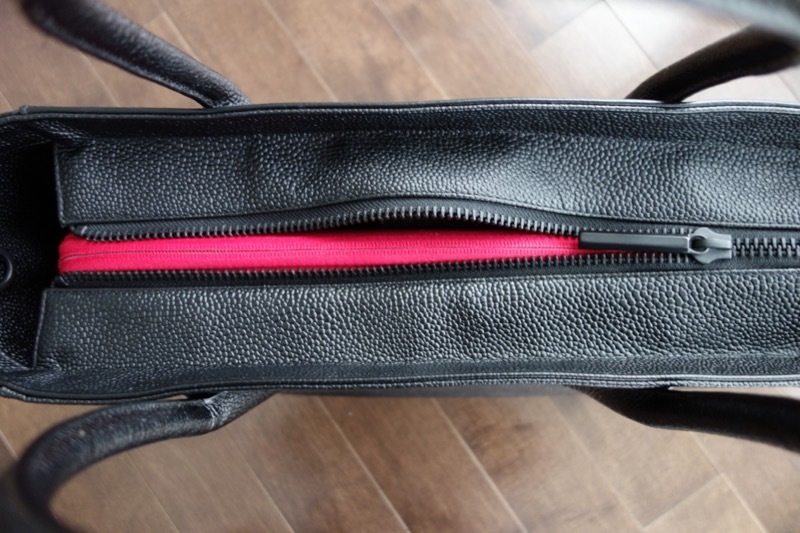 I can even fit the 13″ Macbook Pro laptop in its wool felt case across the middle too but it takes up the whole space and it DOES NOT ZIP UP as you can see. It does make it easier to carry across your shoulder when it isn’t so fat and it is slimmer, so the new design is very nice. 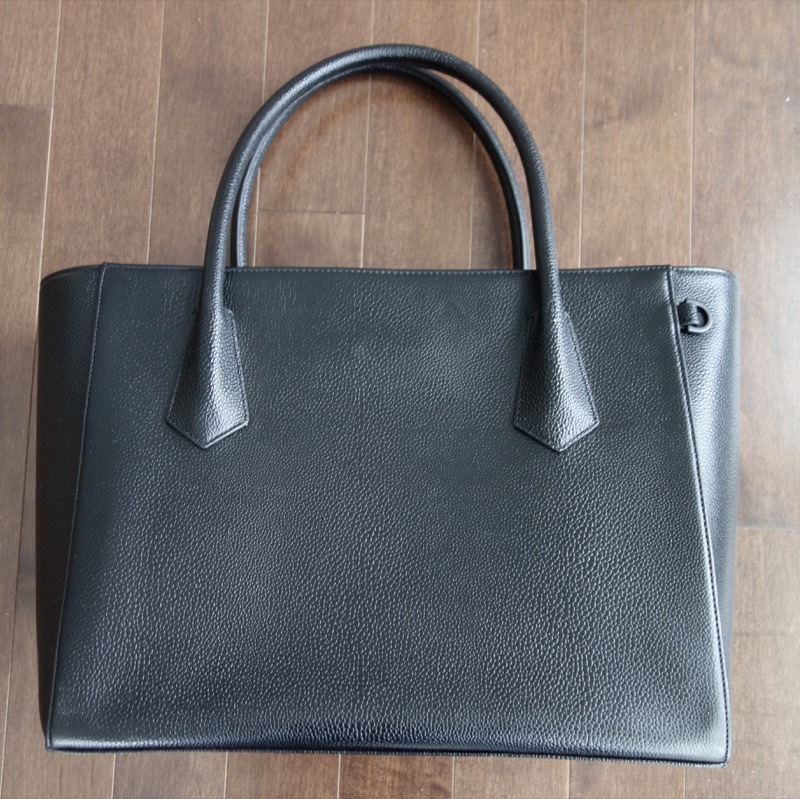 I suspect the larger sizes of this tote would be a great size to tote around, and much easier to carry than the Original 15″ Totes (the leather stingray embossed one). What it fits, is my iPad mini, super easily, with lots of room to spare. A full-sized iPad would be fine. I also tried my A4-letter sized folder and it would just barely zip up if I tried. 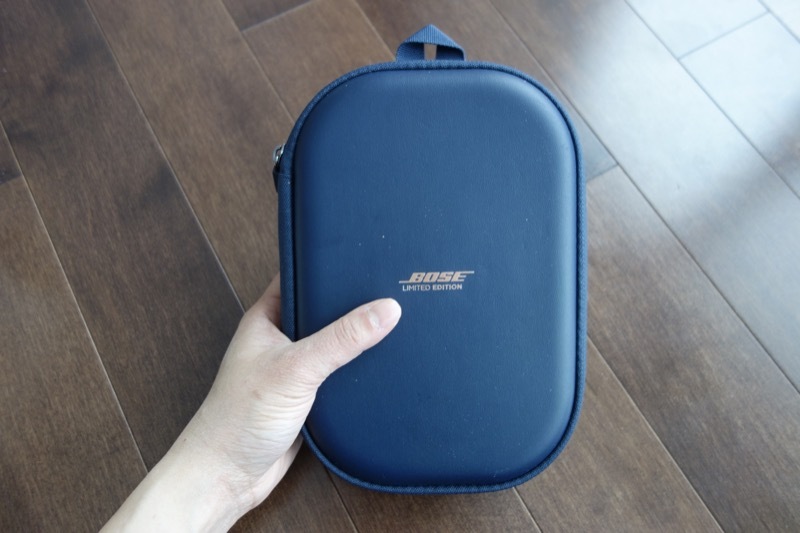 Otherwise, the space inside is sufficient for the Bose headphone case for instance, and leaves lots of room for other things. 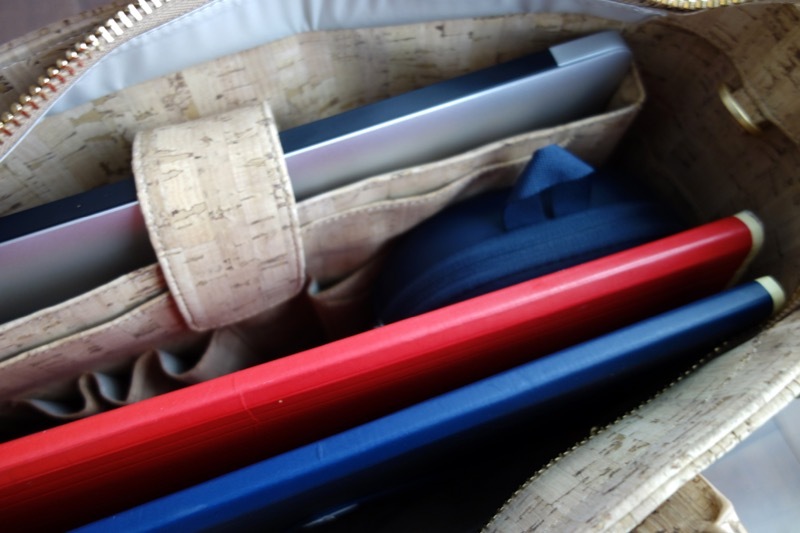 It’s the perfect size for running errands WITHOUT a laptop or folio, so not a work tote. 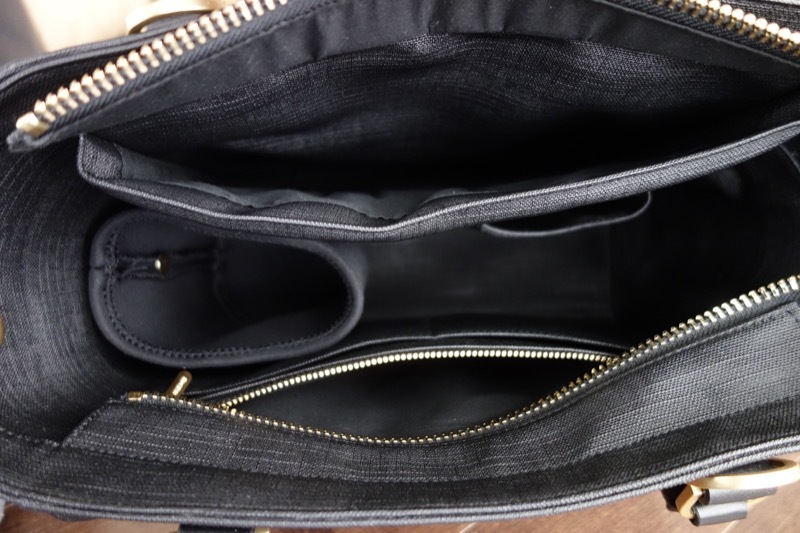 They always do this part well with lots of pockets, and interior zip pockets. I LOVE the side zip on the bag itself. 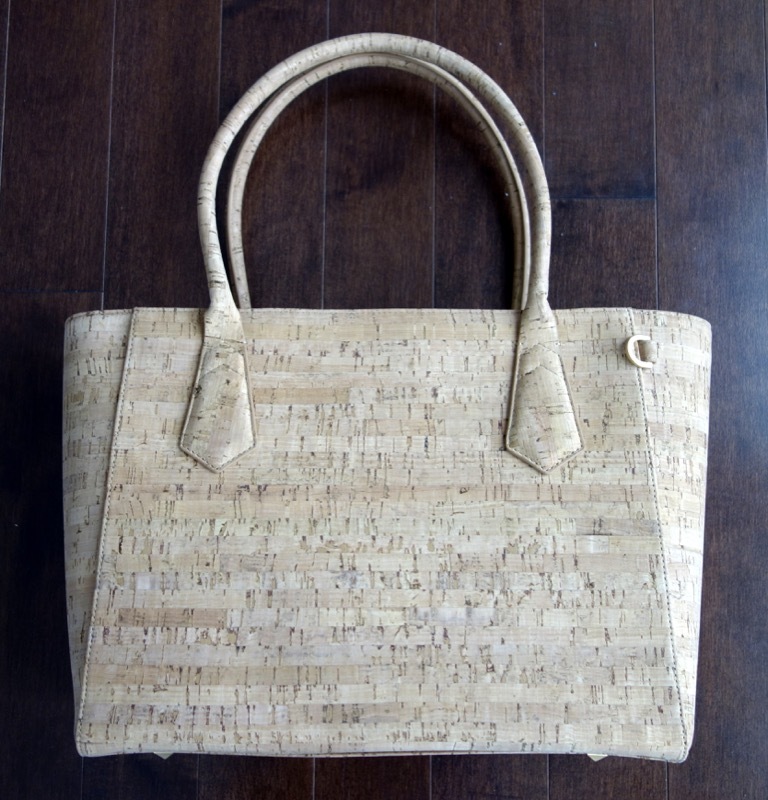 I bought this Original 13″ Cork tote during their sale of old stock because I thought it would be lighter (I was right) and a great material for summer wear while being very summery. 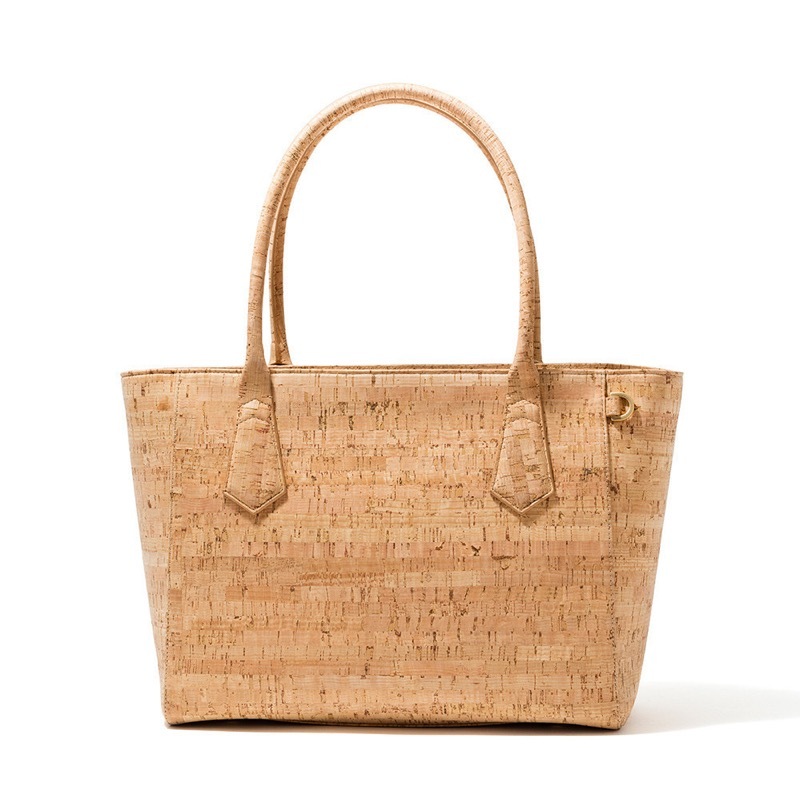 Leather and other such fabrics don’t feel as easy or breezy as cork for the summer. 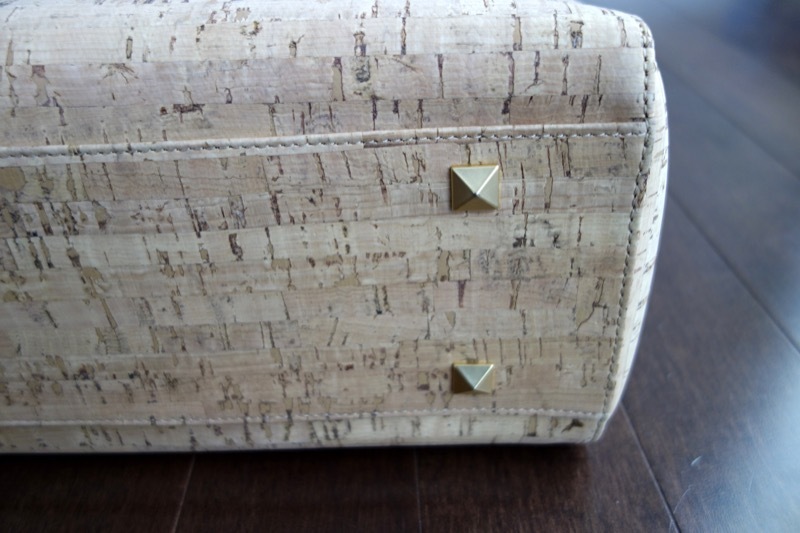 Cork is soft, it looks great, summery.. and still holds things in such a wonderful, organized manner. It is a good solid 13″ size, just like the original. It is soft to the touch (cork!) and it slings easily over my shoulder. 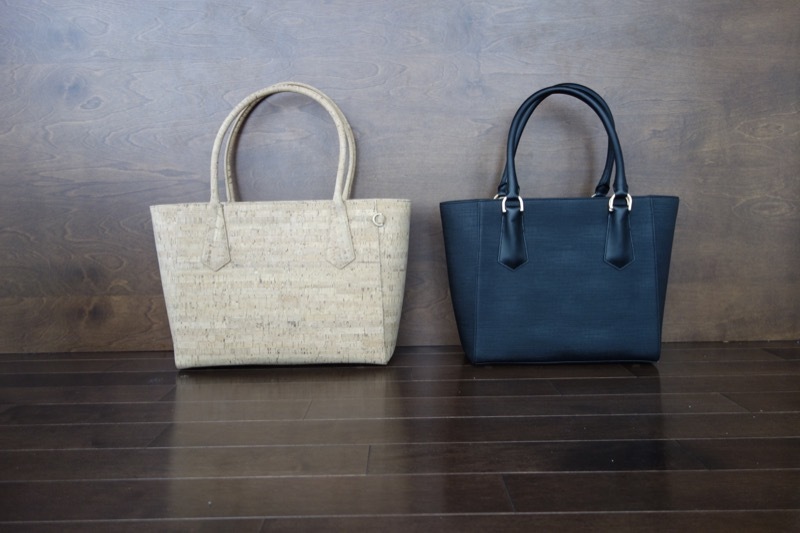 It is the original size which they no longer make, but it is a good size and VERY light, the lightest of all the totes reviewed, which is surprising because the Midi Tote (doesn’t fit anything but an iPad) which is in the coated black canvas is actually slightly heavier than this one just because of the Cork fabrication, even though the Cork is 13″ and fits a 13″ Macbook Air. I’m quite pleased I snagged the Cork. 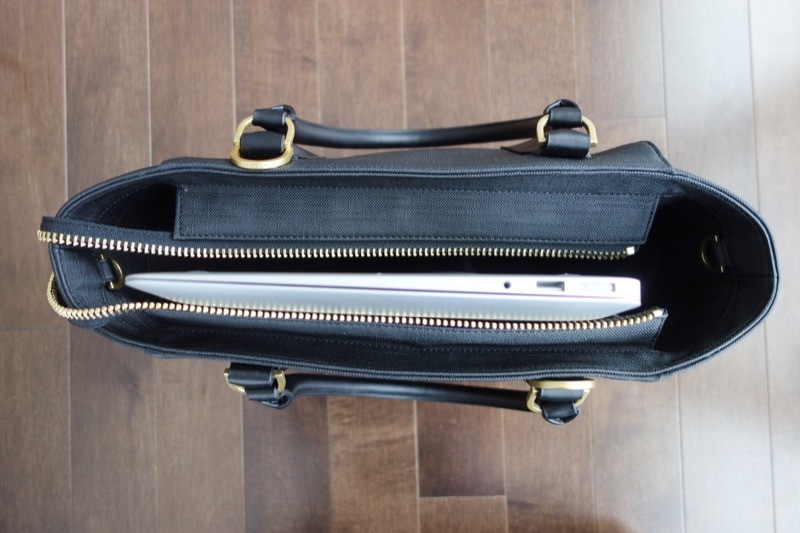 It fits the 13″ Macbook Air in its wool felt case across the middle and it zips up fine. But when you remove the case, you can fit it in the laptop slot as promised. 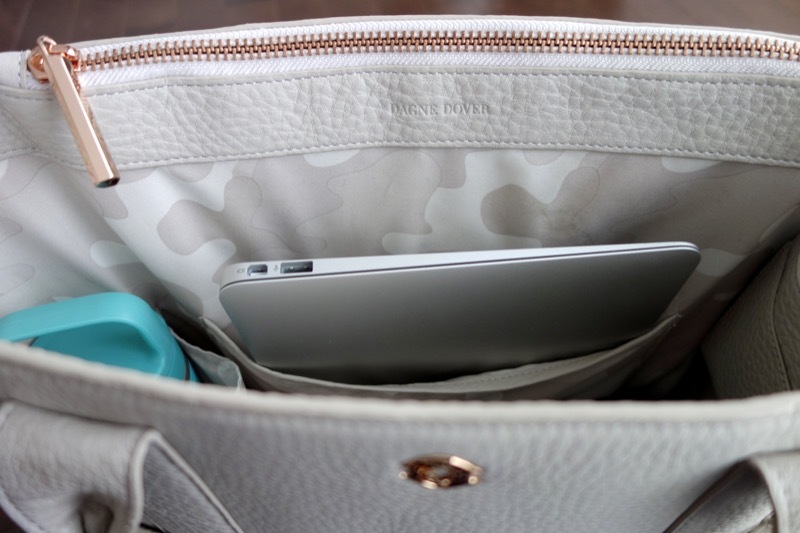 Lots of spots to put your things, zippered compartments, a metal flap to keep your technology in line (although if you are putting laptops and iPads there, you don’t really need the flap to hold it in place, I think). 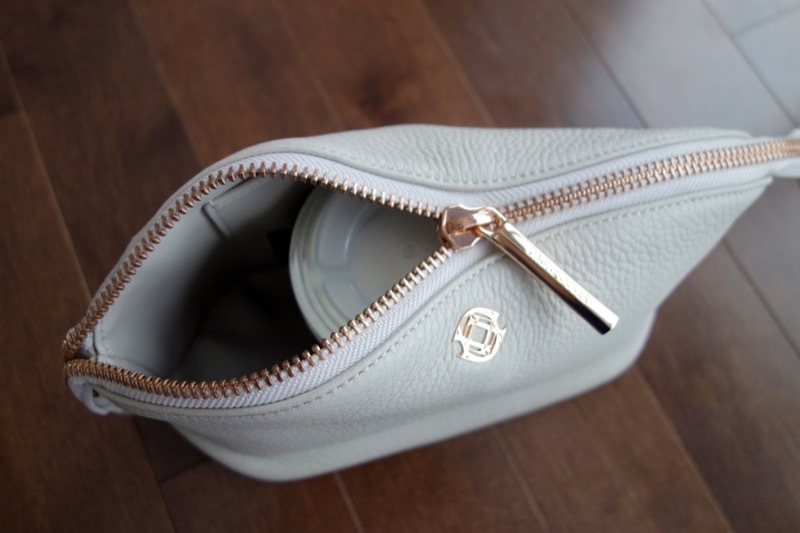 It even zips up beautifully. 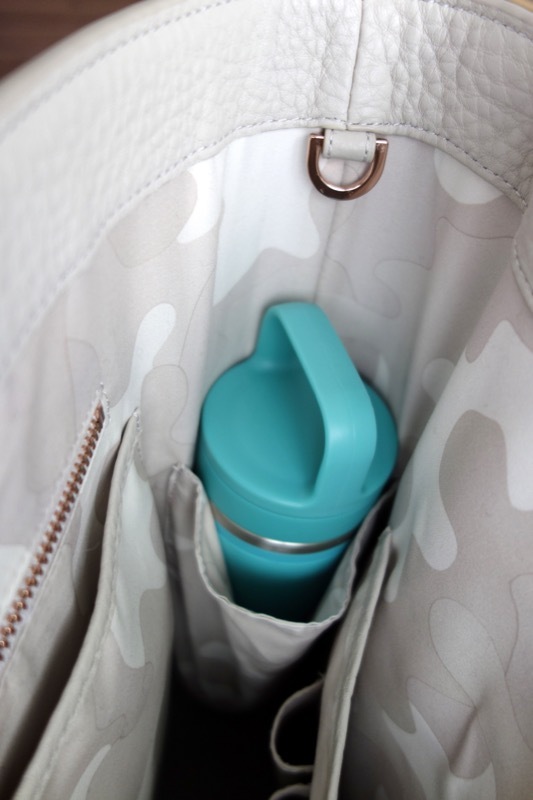 There’s also a dedicated bottle holder in every single Dagne Dover bag and I use it sometimes for my water or tea in a mug but I really use it more often for my purse and keys, as it all fits so nicely in that neoprene section, and I just reach in and grab them as I need them. The Charlie mixes sleek sophistication with super-smart functionality to create the ultimate go-anywhere bag. 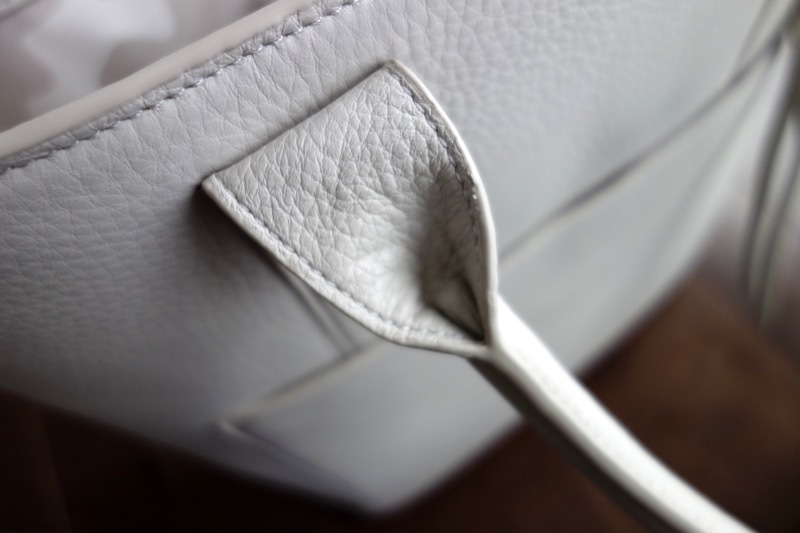 No detail is overlooked: from the handpicked, drum-dyed oversized pebbled leather and unexpected waterproof camouflage lining to the substantial hardware that finishes each piece, we have brought quality, utility, and style together in a celebration of striking simplicity. Every bag is a true labor of love, from us to you. 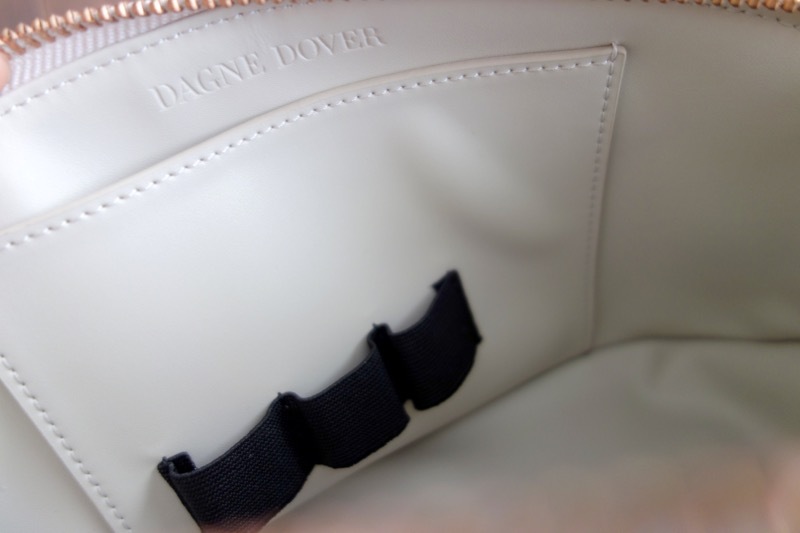 Pebbled leather, in a nice light grey stone colour, with GORGEOUS rose gold hardware. I think if you are okay with a few stains here and there on occasion, Bone Leather is gorgeous and the combination is just so stylish. The handle is also doubly reinforced with a stick-like thing in there to keep the shape. It is the tallest of all the bags because it fits the laptop standing upright rather than on its side. Heavy as it’s all thick, pebbled leather. 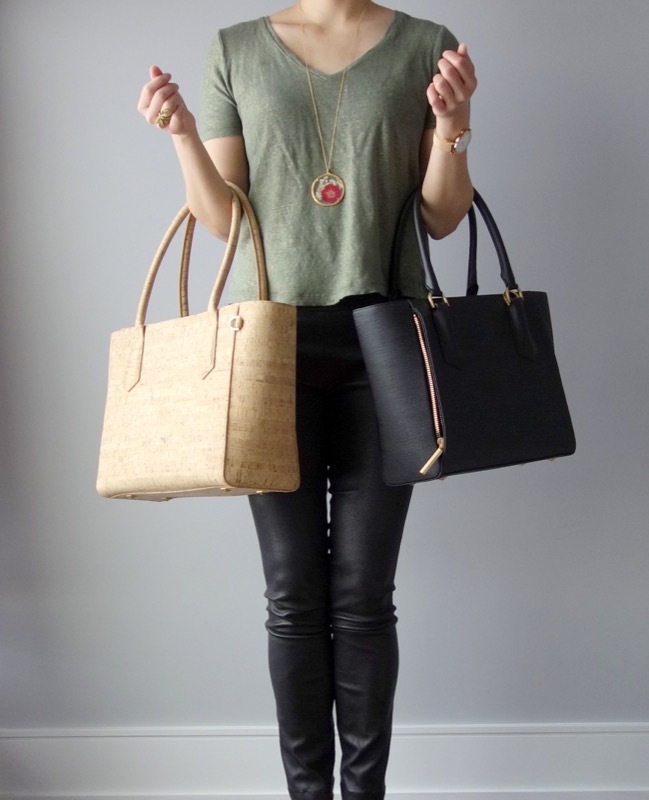 It is heavier than the Original 13″ Cork tote by far, heavier than the Midi Tote, but lighter than the Original 15″ tote in leather. 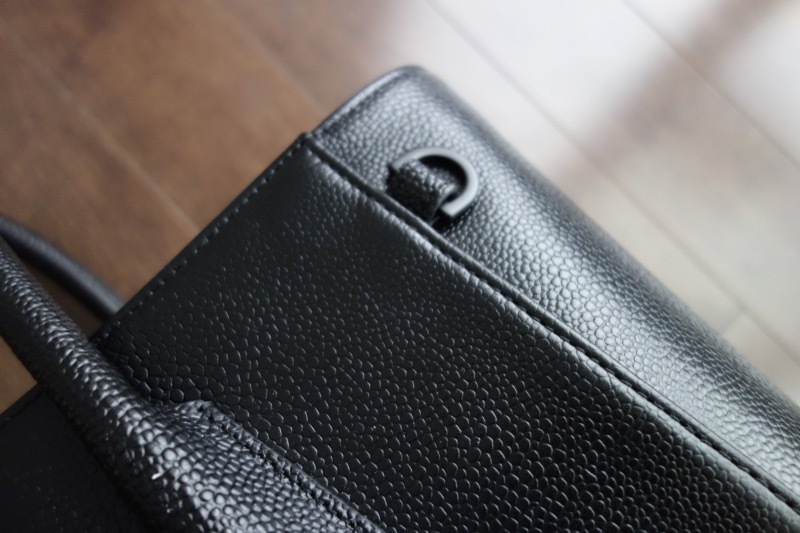 It rivals the weight of the Original 15″ and it is because it is just completely done in leather and the hardware is SOLID which adds to the weight. Quality = Weight. You wouldn’t want it to be flimsy or else it would wear down easily. MY FAVOURITE OF ALL THE BAGS. If you only buy ONE Dagne Dover bag for commuting and general style, make it this one. 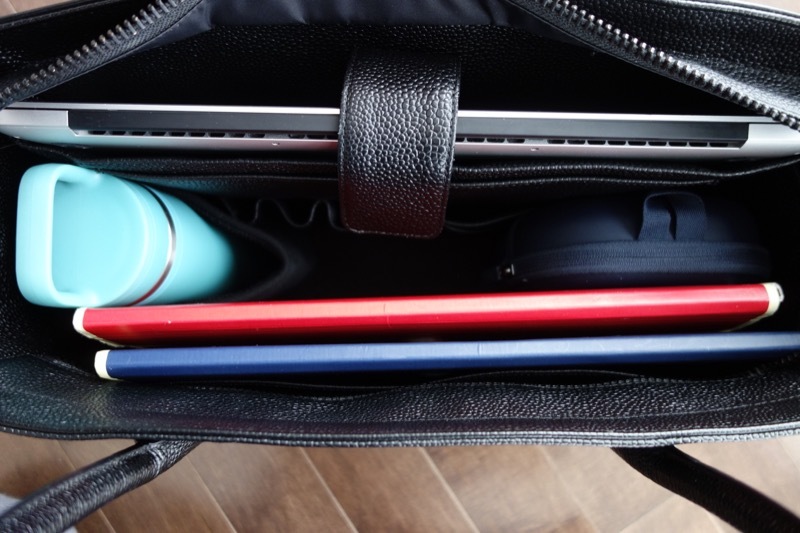 The space is sleek and although it is quite a tall bag compared to the others, it more than easily fits a 15″ Macbook Pro without the neoprene case (and you can zip it up), or you can just slide the entire thing with the neoprene in there and it doesn’t zip up. Lots and lots of space, I couldn’t believe how great it was. I mean look at how much space is left after a laptop is in there and two file folders, plus my Bose headphone case at the bottom & the travel mug. 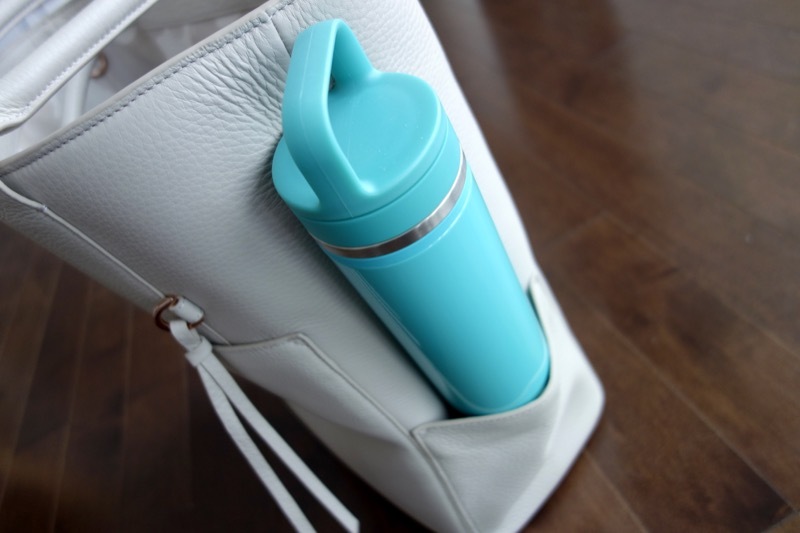 If you didn’t want to use the neoprene holder for your mug, the side pocket does fine too for a tall mug. My FAVOURITE of all the totes. They thought about pouches everywhere, for instance this leather pouch above has a slit for your metro card AND your phone in one spot. It has magnetic pouches in front, another mini pouch on the side which DOES NOT fit the travel mug but I put it in there for you to see the size and thickness. 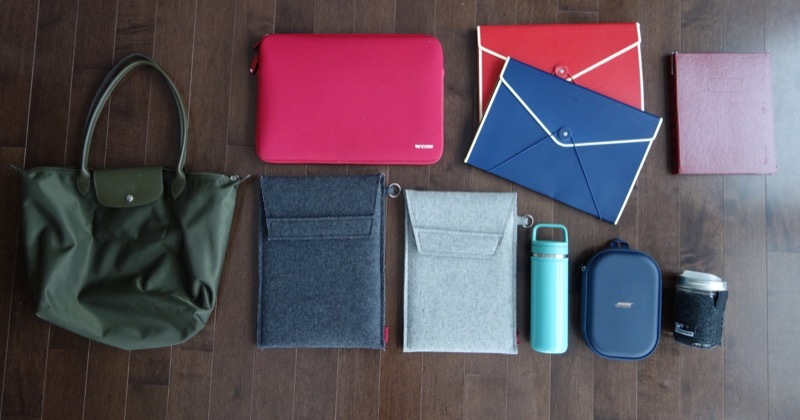 I could even fit the 11″ Macbook Air in the front pouch if I wanted. 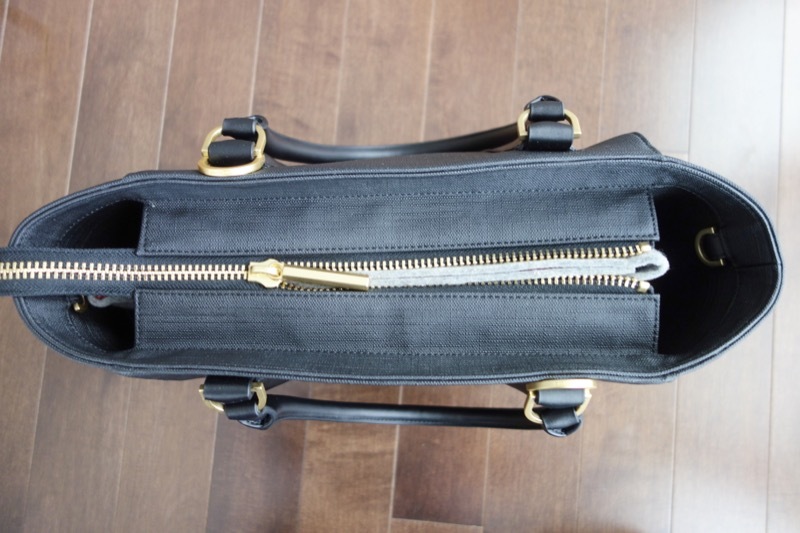 This is a bag you could travel with, if it had a zipper on top to close it all (which it doesn’t). 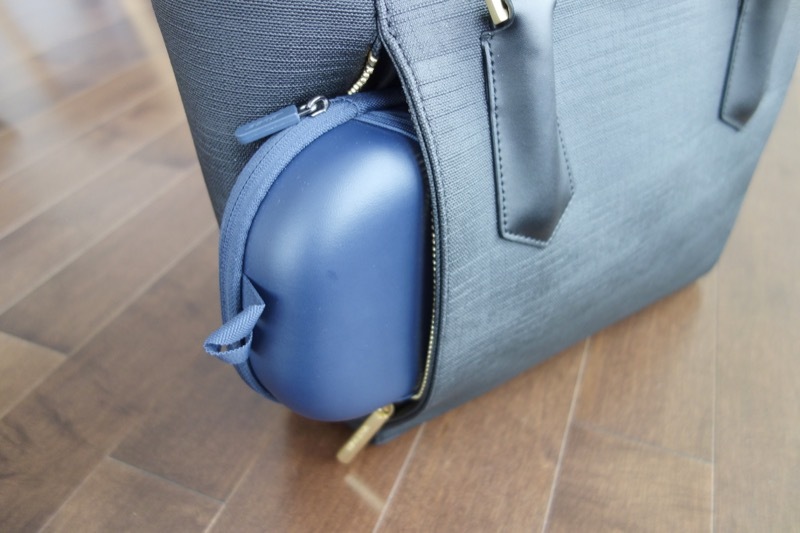 I’d say that’s the only flaw in using this tote to travel because when you fly, you need to tuck your bags underneath for takeoff & landing, and without a zippered top, everything will slide and fall out everywhere. 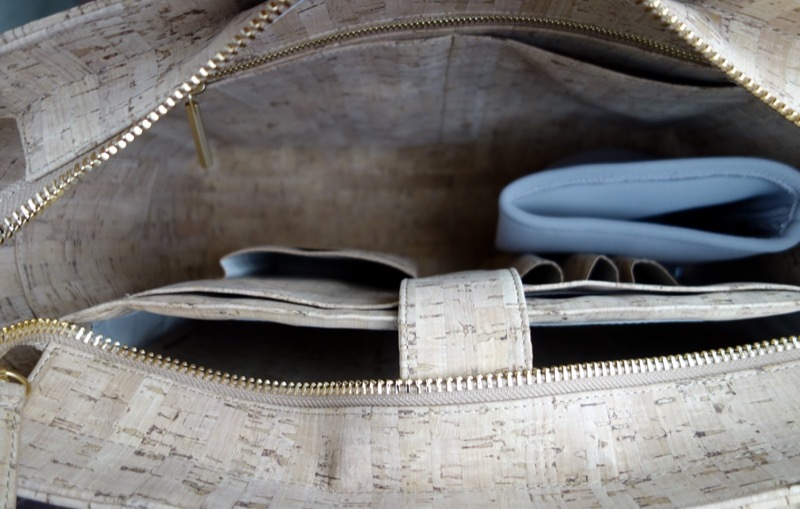 It is a seriously great bag with so much organization, a commuter’s dream if it also weren’t for the lack of pyramid feet (can’t put it on the floor, on your lap only! ), but that’s a minor point for me. 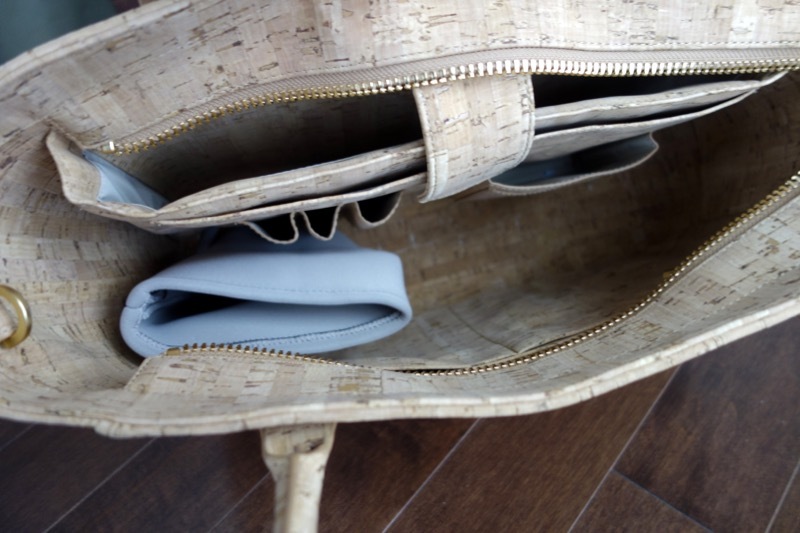 A versatile, hold-anything pouch, our largest Lola was designed as a makeup pouchette, but looks chic as a clutch too. 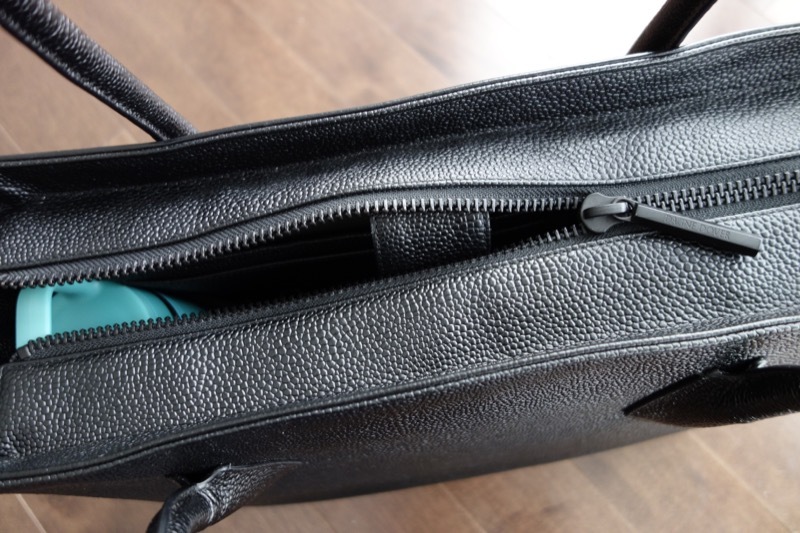 With an ideal shape and structure to fit full-size brushes, its two open slip pockets feature invisible magnetic closures and easily fit compacts to prevent spilling and breaking while you’re on the move. 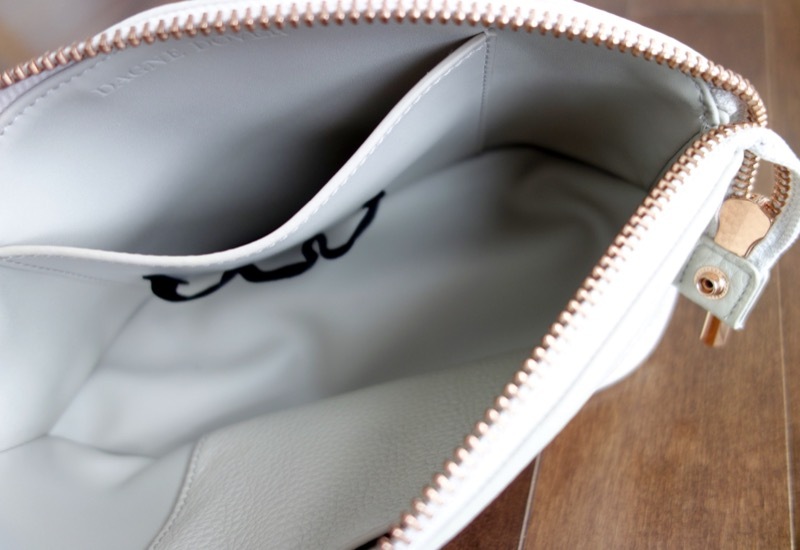 A smooth lining allows for easy cleaning, making Lola much more than your average pouch. 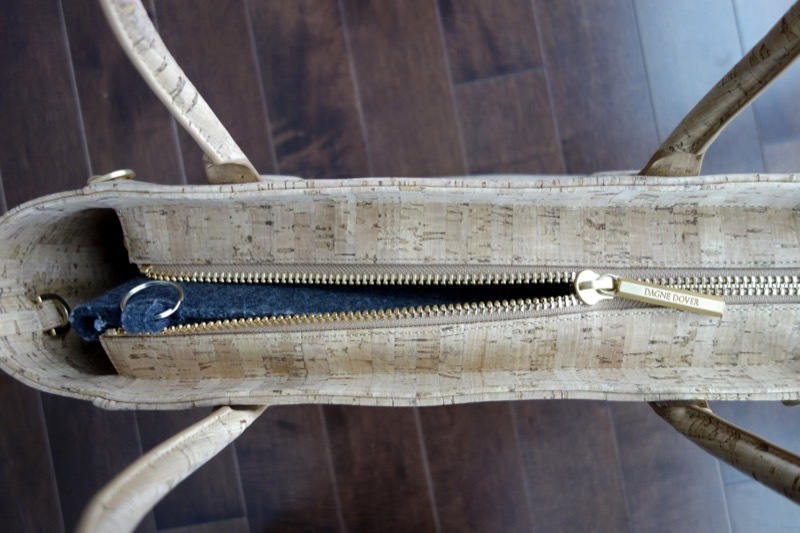 Unsnap the zipper tabs to adjust the shape. Just as good as the Charlie Tote and all of their other bags. 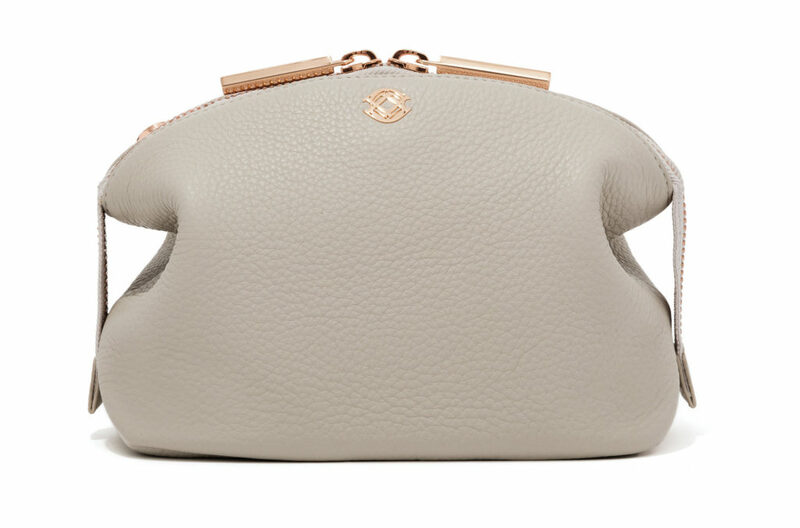 Soft, pebbled, elegant leather, gorgeous thick rose gold hardware.. it all adds weight of course, but my goodness. I find it big enough to use as a clutch if you plan on going out. It is JUST big enough to tuck under your arm. Thick heavy leather = weighty. 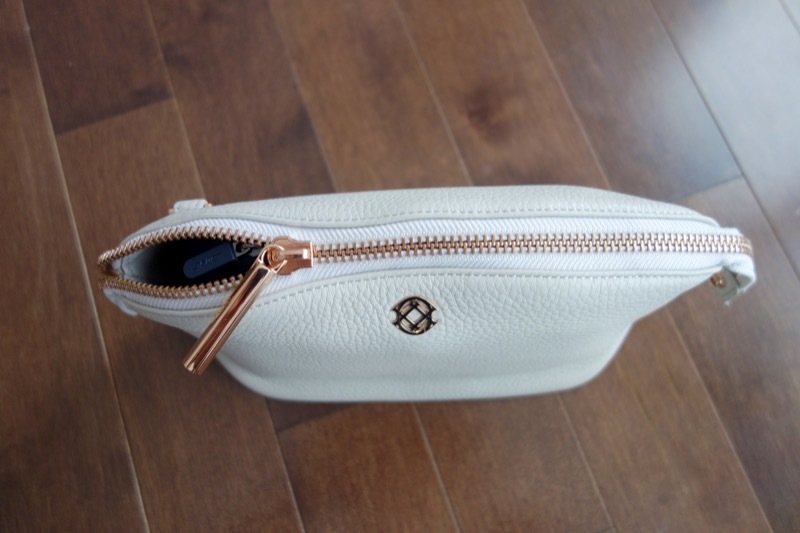 Just the pouch alone feels heavy compared to a flimsy nylon pouch, but it is just so elegant…. Fantastic. I tried stuffing some items in there so you could see the size but I’d obviously never try to carry a water bottle or mug in this. 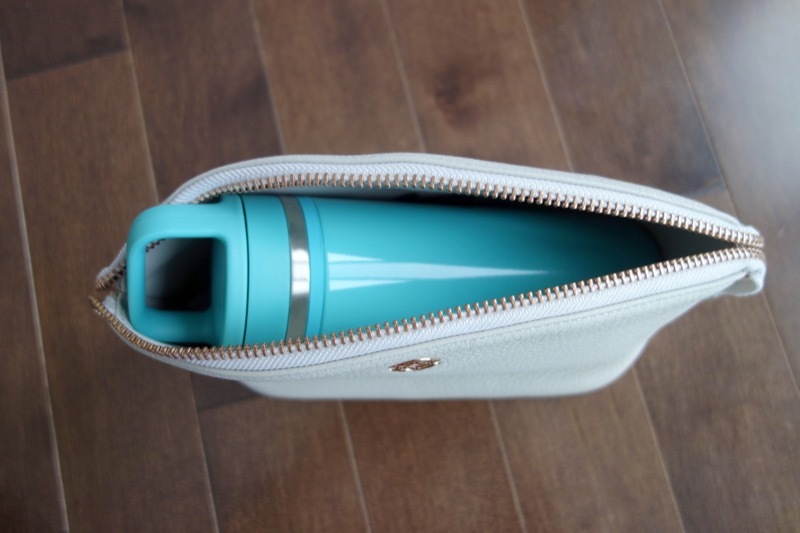 The travel mug doesn’t fit in there, and it definitely doesn’t zip up. But then it doesn’t zip up because it’s too wide, so it gets caught here. Good enough to squish a whole Bose Headphone case in there (just for the sake of trying). Again, out of this world. I know they put in side snaps if you want to make it smaller or bigger but I don’t see the point. I could have done without it. 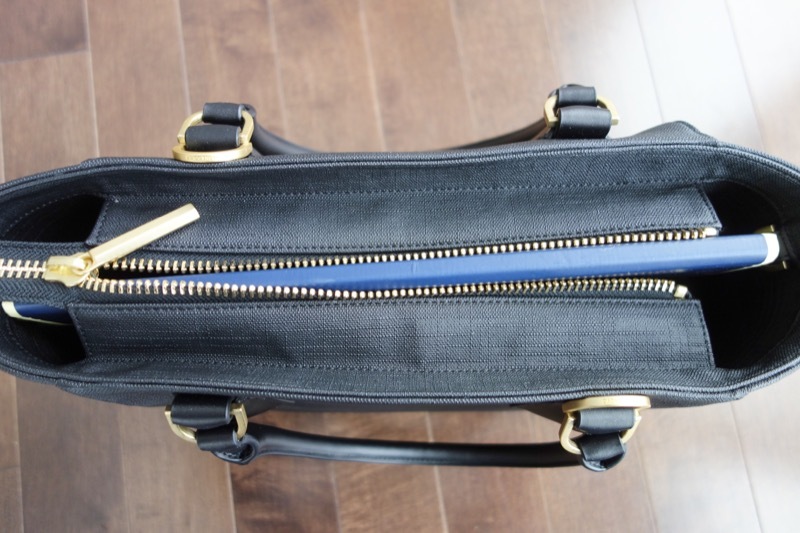 I also like that the zipper on BOTH sides sticks out because it makes it easier to grab and pull the zip closed or open rather than struggling, and the hardware is of course, stylish and perfect for pulling it open and closed (no struggling here). For the record, I am 5’5″, wearing no heels or shoes for that matter, about a US size 4 in the body (but my shoulders are US 6) and I’m about 123 lbs. They are solidly made and some of the most beautiful bags you can buy for the price and quality. They are slightly heavy of course with all the hardware, the coated canvas, and leather, but it’s what you pay for. They’re well worth the cost, and will take a beating and clean right up with a damp rag. 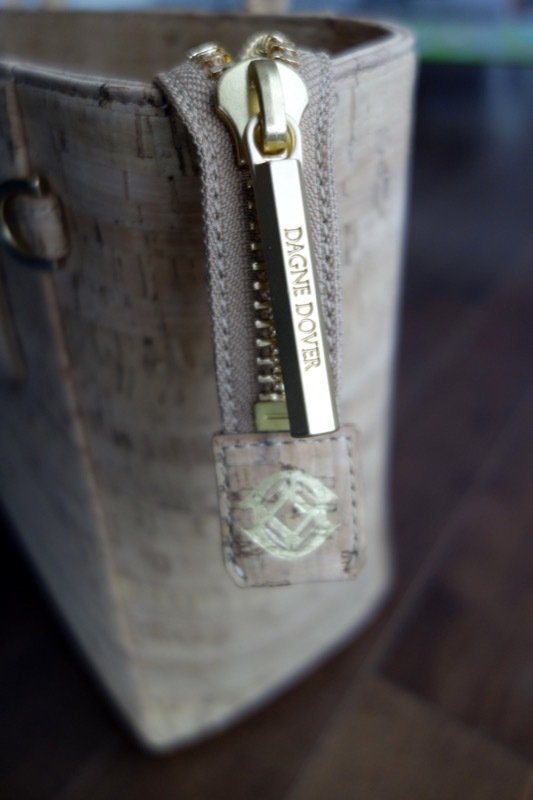 The hardware is just stunning with the etched name “Dagne Dover” discreetly printed on the thick, gorgeous zippers (which add to the weight), and the combination of Bone Leather with Rose Gold hardware is everything. 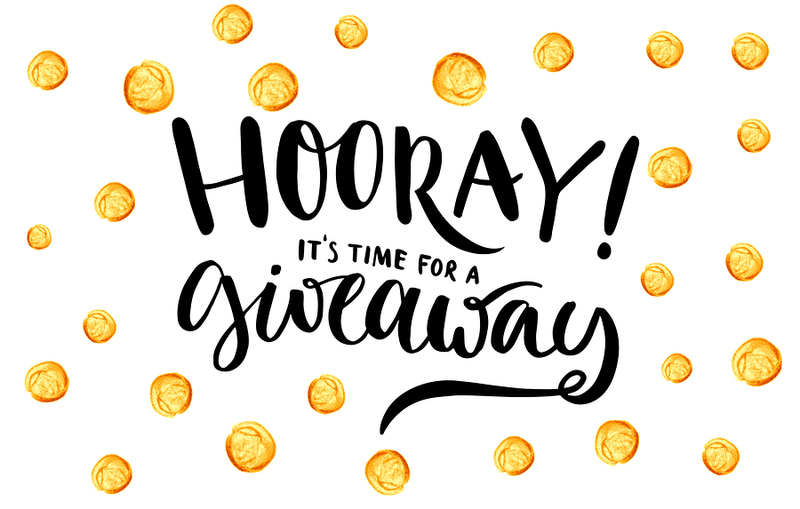 YEAH YEAH, GET TO THE GIVEAWAY! I have too many bags (what a lovely problem to have, no?) 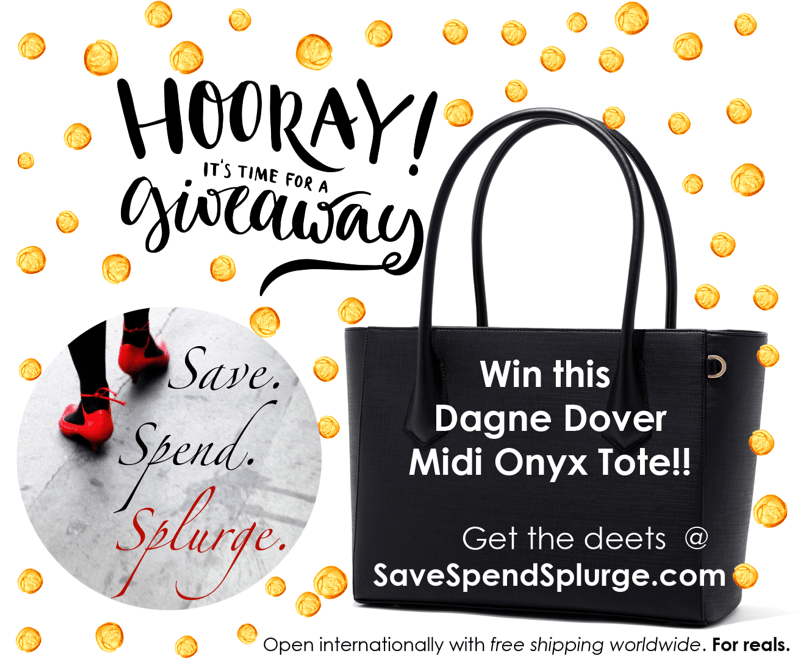 so I am giving away the Dagne Dover Midi in Onyx Canvas (shown above) to one lucky reader, open internationally with free shipping. You don’t get to choose the colour (it’s Black Onyx Coated Canvas). 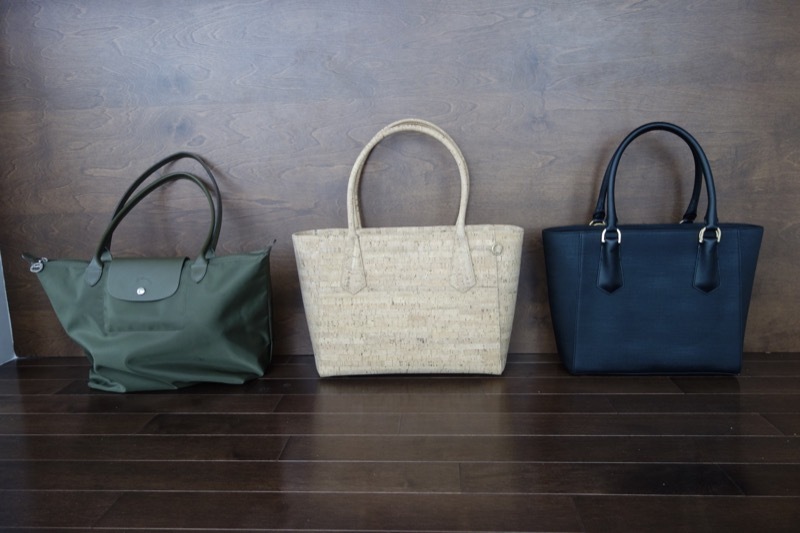 You don’t get to choose the bag (it’s the Midi Tote). But the international shipping is free, and the bag is brand new never used. 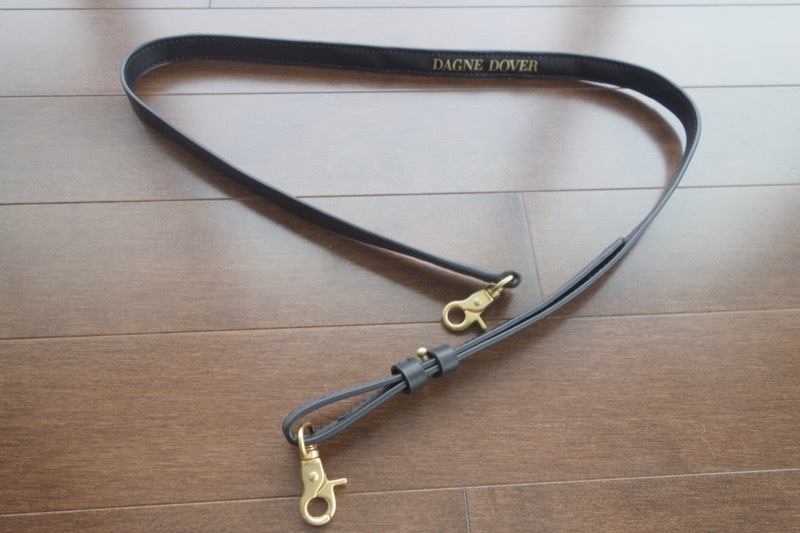 If you don’t live in the U.S., this is probably one of the only giveaways, ever, that will be open to anyone in the world because as much as I love them, Dagne Dover doesn’t currently ship internationally. Go for it! 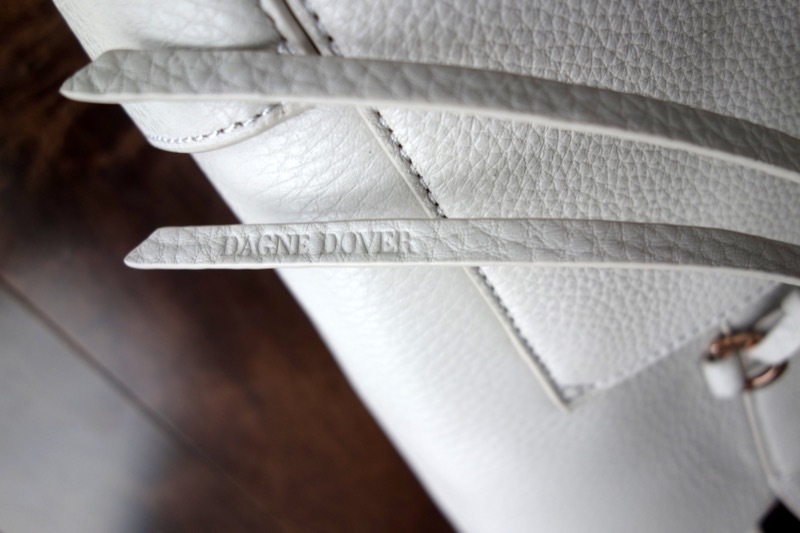 I love the Dagne Dover brand. Awesome review! 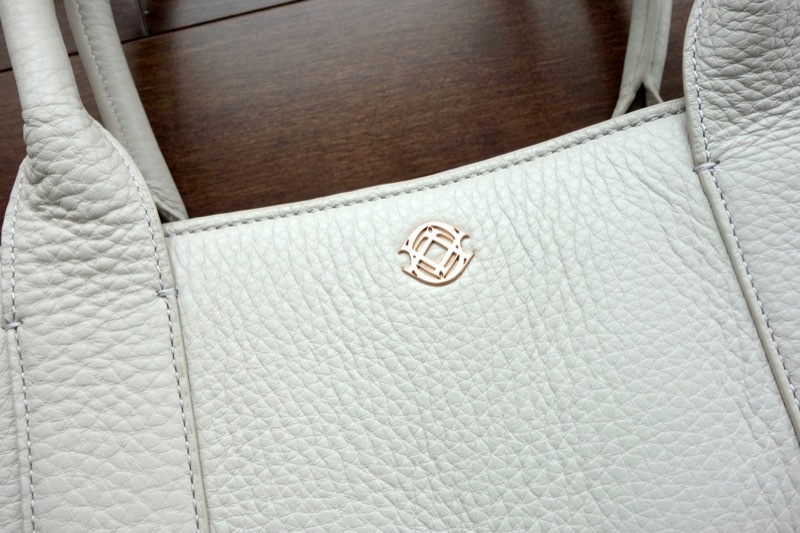 I was trying to decide on the DD Charlie in Bone Leather and my husband was on the fence as we weren’t able to see it in person. 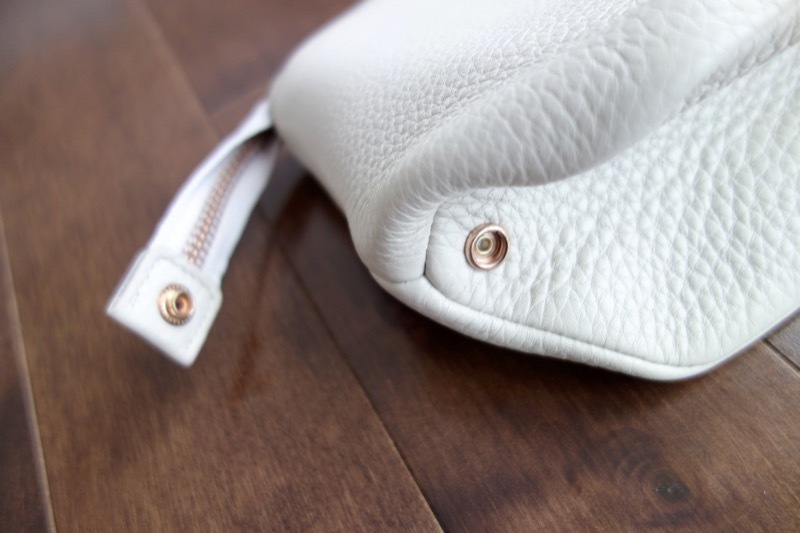 Your review killed it; definitely want the bag now! Did someone end up buying it from you? This was SO helpful! Any chance the Charlie in bone is still on the market? Wow, awesome review. I didn’t even look twice at the Charlie online, but after your review, I have to have it! 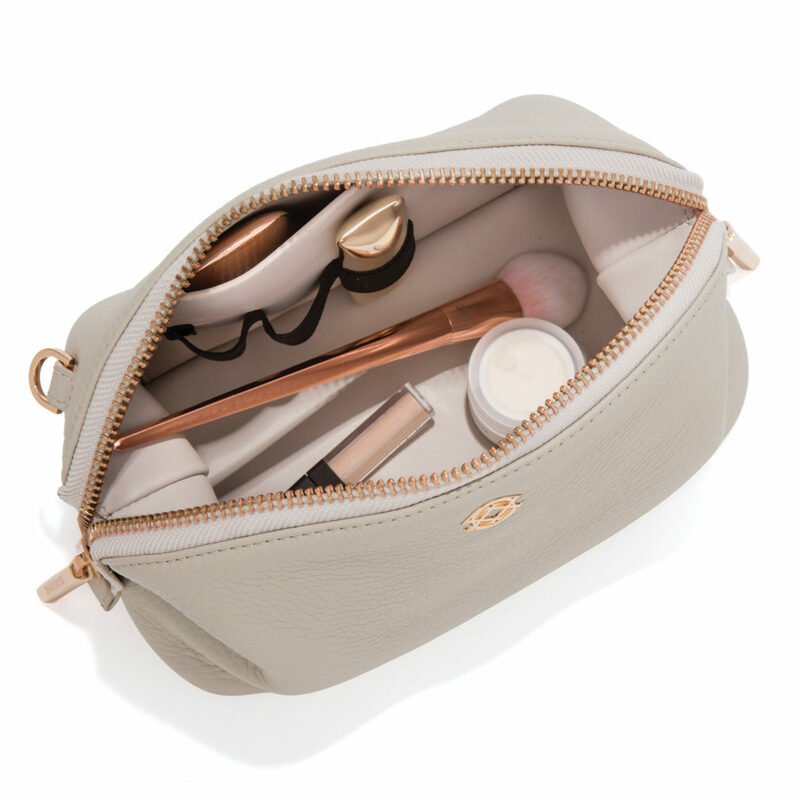 I also love the lola pouch now too…none of my make-up bags fit full-size brushes, which is really annoying when I’m traveling, or even just an overnight at the inlaws. What color is the one you’re selling? It is the exact one I reviewed above — Bone Leather. I only took pictures for the blog and that’s it. Thank you for the information, I wish I would have seen this a week ago! I LOVE LOVE LOVE the Dagne Dover bags decided to order one, got the 13″ it and it way too big…I ordered the Midi waiting to get it. Looks like it was the correct product for me. The Midi is the perfect size if the 13″ is too big. 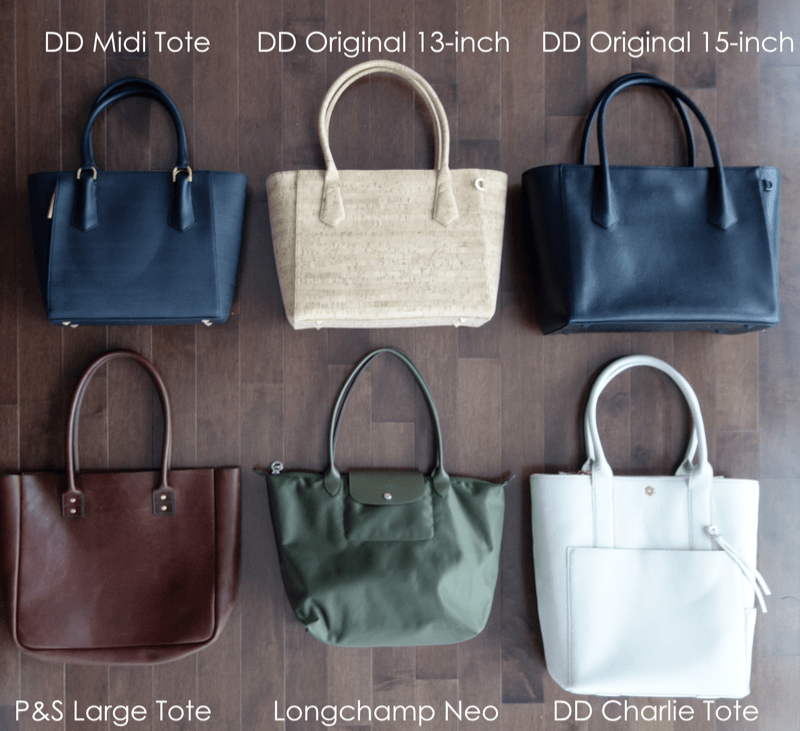 I own all the sizes and find the 13″ is great as a work commuter tote in a light canvas, and the 15″ is good if you are driving or traveling. Stay tuned, I may give something else away! 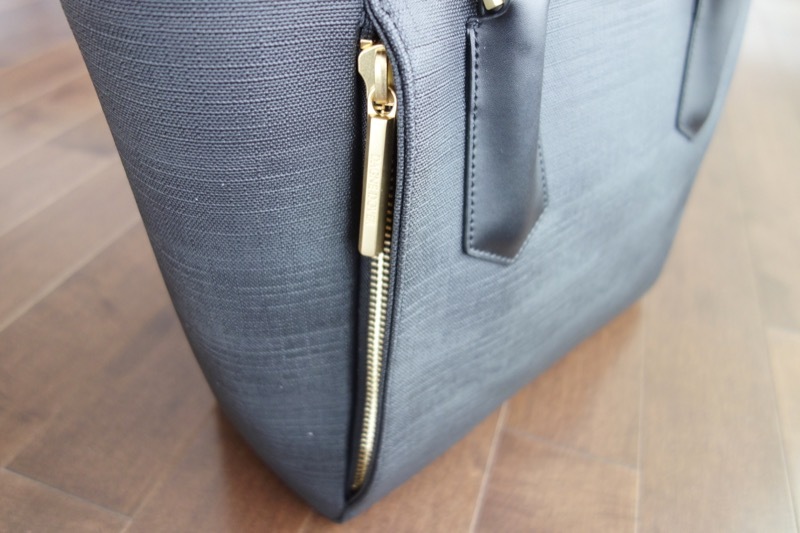 Living in Toronto…I’d love this bag for my mom. 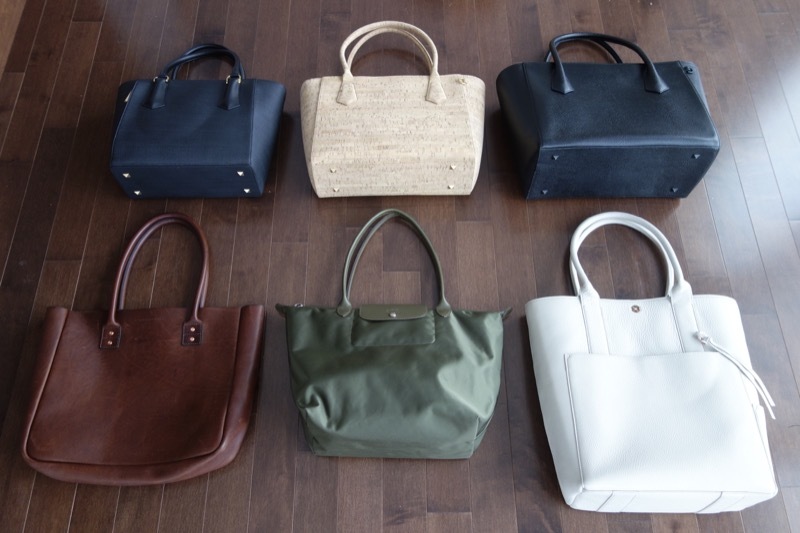 Great bags! Thanks for the wonderful review. I love reading With Love from Kat and See Anna Jane. Posting from Hamilton, Ontario! Thank you for the giveaway. Thank you for the awesomely detailed post! Love your blog. I love reading The Pleated Poppy blog. 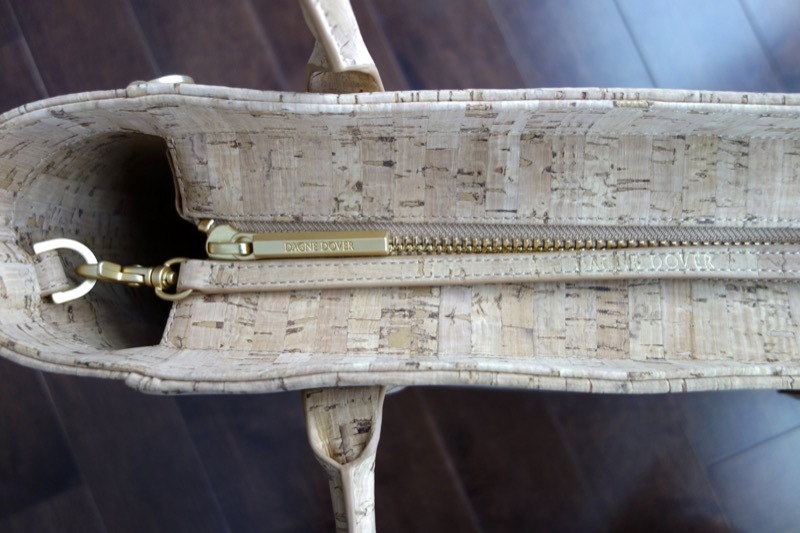 I really like Adina’s site–and I live in Ontario! 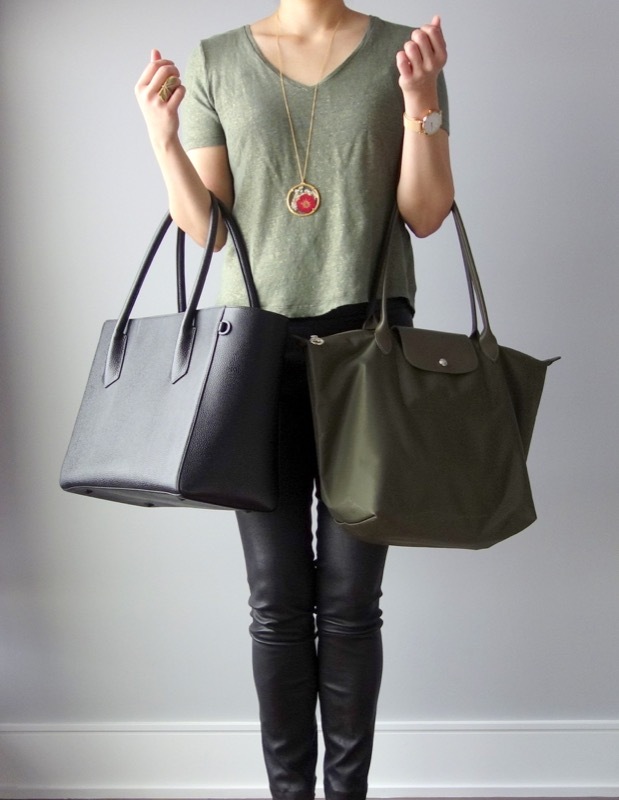 Hello, just wondering how well the Charlie tote fits on your shoulder? Are the handles comfortable, do they slip off easily, etc? They are super comfortable, they do NOT slip off (all covered in leather) and they hold on well. I can even half hold it back with my shoulder as I walk, it isn’t too structured or thick. I’m from Toronto, Canada. I used to read a LOT of PF blogs, now with a LO, I don’t have as much time. I read you, Asian Pear, and Cassie (theminuteglass) still. 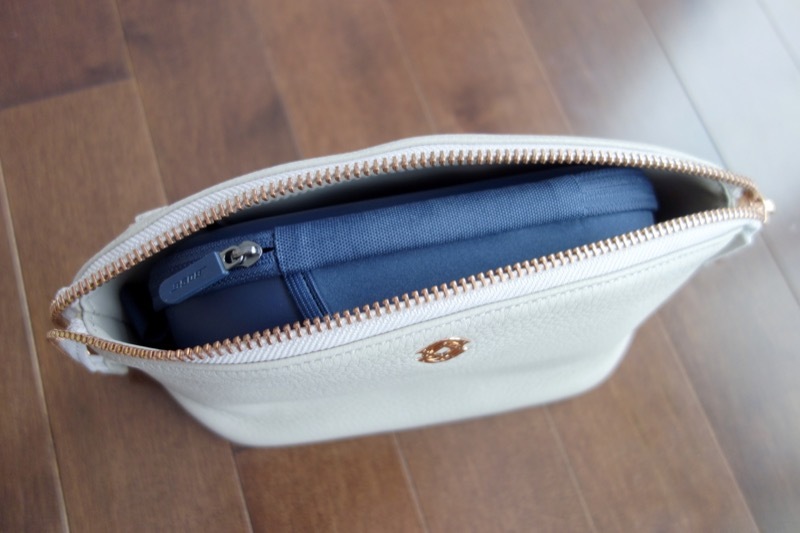 That front zipper pouch for a tablet is brilliant. It’s obvious how much work you pu into this review — I’ve never seen one so thorough. 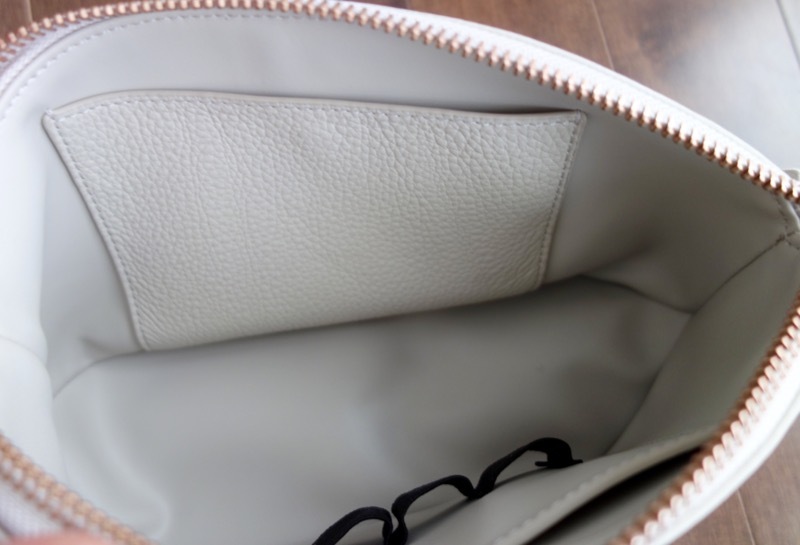 The pebble leather pouch reminds me a *little* bit of my Longchamp makeup bag, but the DD one is bigger with more interior compartments. This isn’t a brand I was familiar with before reading your post, but I will definitely be checking them out! Reading your blog from Texas, USA. I love to read Not Without Salt for all of her amazing recipes. I’m read you from good ol’ Long Island, NY. Thanks for the chance to win. I follow The Middle Page. Cathy Williamson. I’m a Central Texas girl. center point to be exact. I don’t follow too many blogs aside from yours but the one I’ve been loving lately is 600 sq ft and a baby. I live in Vancouver (well Burnaby), but we live in a 800 sq ft apartment with a toddler and am thinking about expanding our family, but we can’t afford to buy a bigger place so I’m always looking for how to “make it work”. Awesome giveaway. Hm … a good blog I read. I love advice columns – so I’m a huge fan of Carolyn Hax (Washington Post), Ask a Manager (brilliant) and Captain Awkward (really great advice. Don’t always love the commentariat). Hailing from Ottawa! I follow the Work Edit but you might be already following her. Wow! That was thorough! 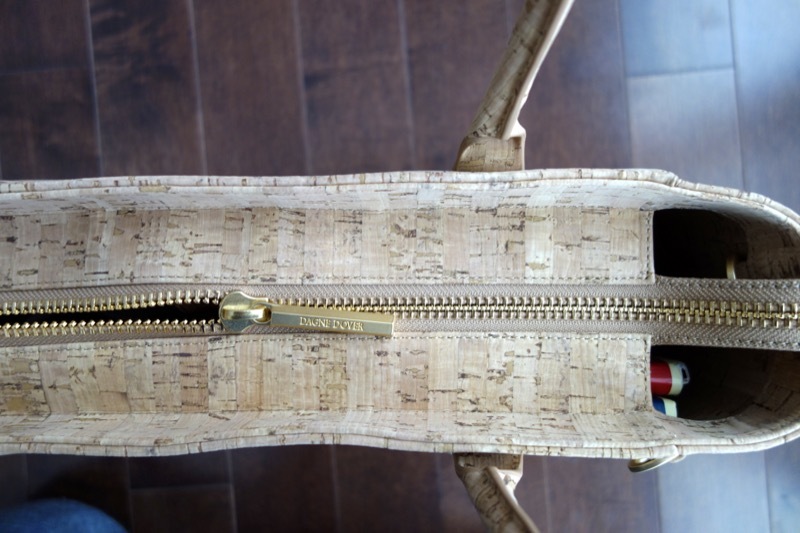 The cork is lovely, I like the juxtaposition of the casual material with a formal shape. Beautiful bags. Thanks for the size comparison photos. Woah Sherry! 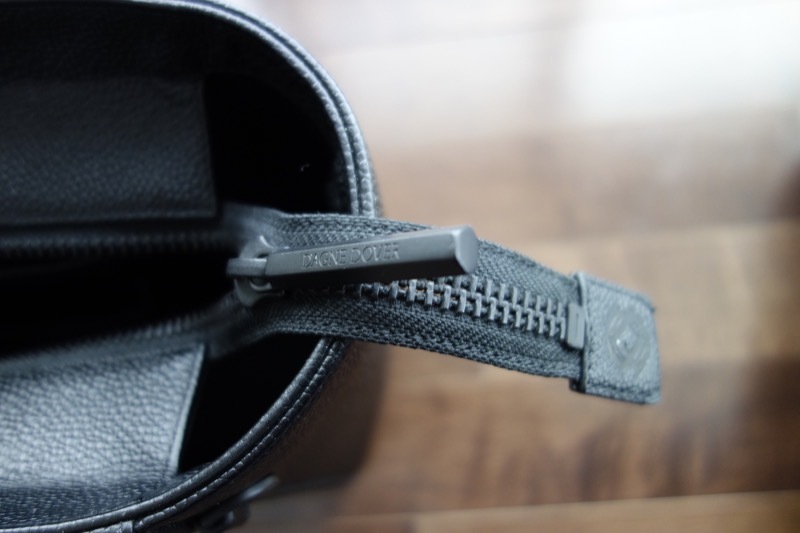 Thank you for the most DETAILED bag review I’ve ever read online! 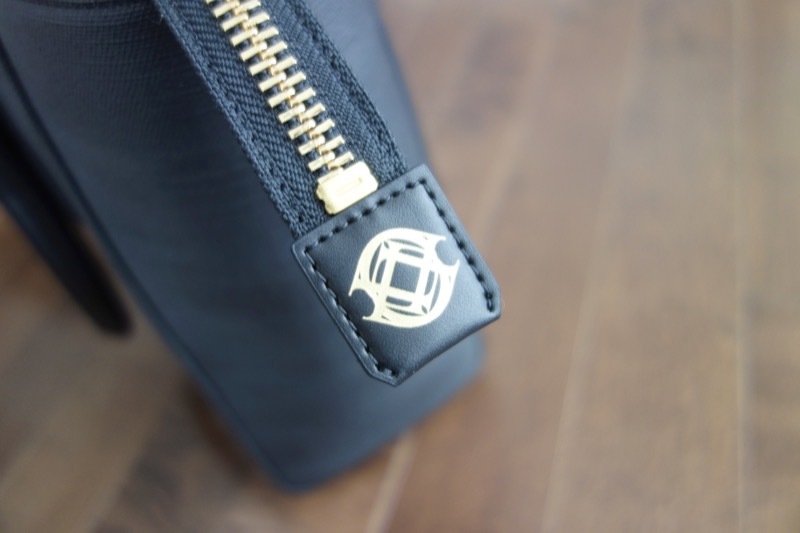 I’ve been thinking about getting a DD bag ever since reading about them on BI and your review sealed the deal about whether to make the investment or not. You’re awesome! Living in Toronto, currently on vacation in Japan! I’m a big fan of Eric Barker and bakadesuyo.com – worth reading his newsletter every week! I really like those bags. Thanks so much for the giveaway. I’m from the Columbus OH area USA. 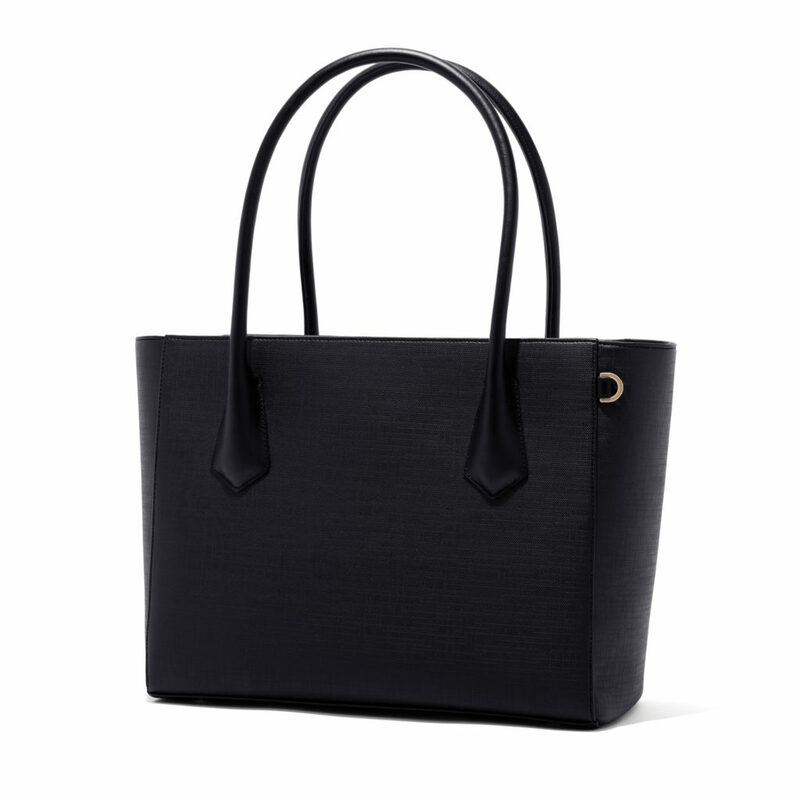 Really hoping to be lucky enough to win the beautiful black Midi Tote! What a massive amount of detail you put in your post in regards to all those scrumptious bags, sigh. Being out in the countryside, don’t have the money or access to these items, and I agree with Claire, the diversity in your posts keeps us coming back for more. Never heard of these bags. They are gorgeous! Thanks for introducing me. One of my favourite bloggers is Scarlett Ballantyne of That Mom Hustle. We worked together a few years ago when I lived in Vancouver, BC. I currently live in Waterloo, ON. Bags look awesome!! I really loved all the interior shots so you can get an idea of how much it can actually fit. Oooooh! I love this bag. Just bought the medium Landon for going to the gym and it is great! Hailing from Brooklyn, NY so an organized, light-weight bag is a must! Hi from the US. I’ve been stalking these bags so I was really pleased to see your review. The quality of the leather looks amazing! Beautiful! I’ve never heard of the brand before, but I’ll check them out when I’m ready for my next purchase! It feels like a cop out naming a bigger blog, but I’ve really been into The Anna Edit for the last few months. I always enjoy your honest and thorough reviews – thank you!! One of the bloggers I follow is Westmount Fashionista. I am from Montreal, Canada. These bags are beautiful! Would be so lovely to get a package from Montreal! Hailing from Halifax, NS but previously from Sherbrooke, QC. Love reading your blog – appreciate the diversity in the types of posts.